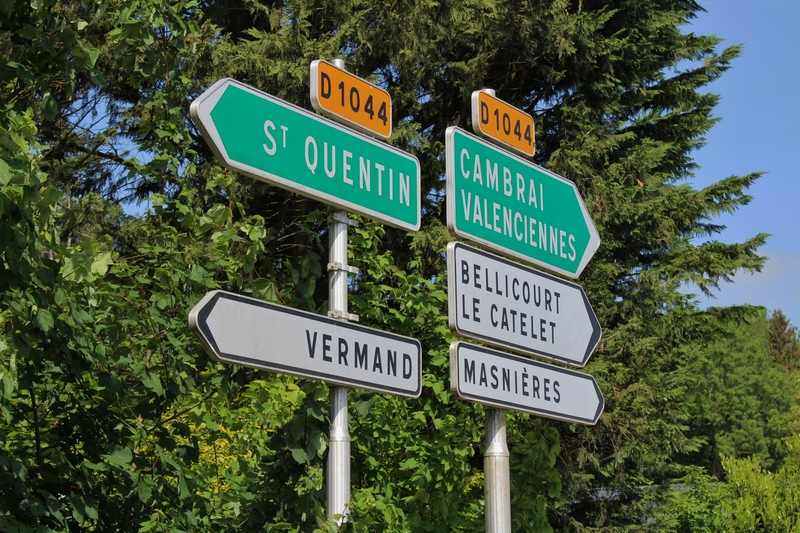 The road signs point to places with famous names to those with an interest in the Great War; St. Quentin one way, Cambrai the other, names that speak of the latter months of the war and the final Allied advance to Armistice. We, however, are looking for a different, and less prominent, sign, to get us to the start of this post. 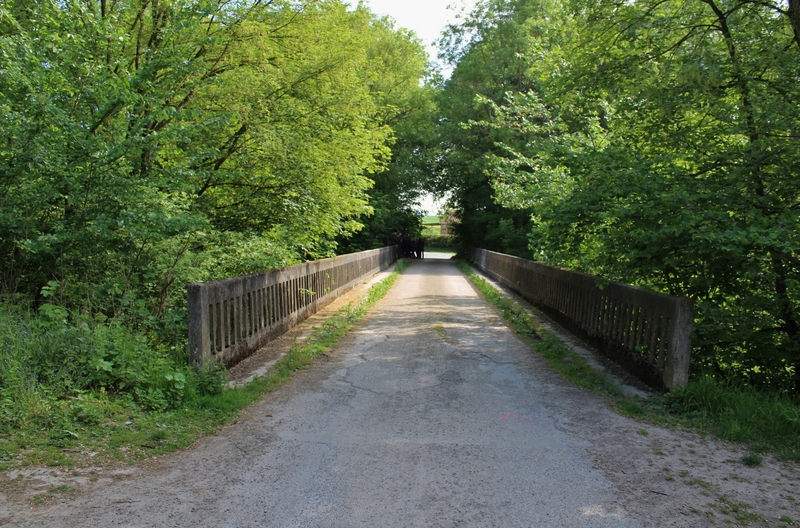 You might not even notice it, if you weren’t looking, and even if you did spot it there is no suggestion of anything but a small bridge and an equally small road over the nearby St. Quentin Canal. 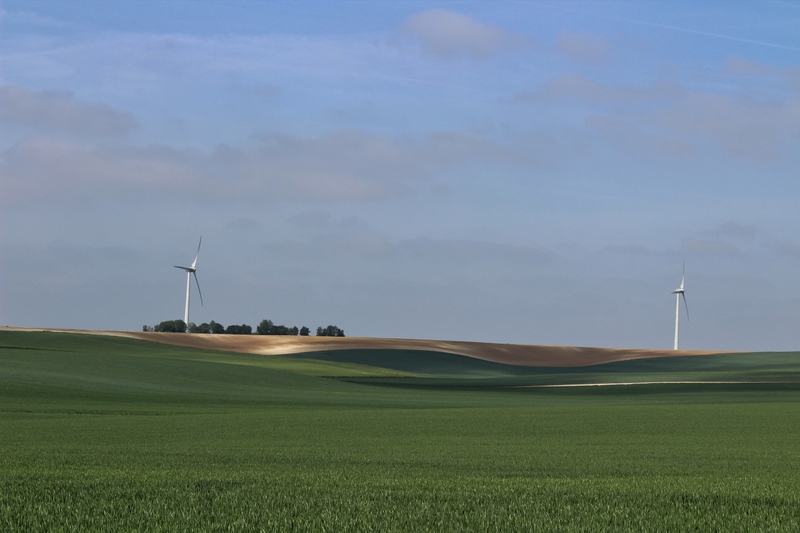 The battles of August & September 1918 had seen the Allies advance, slowly but inexorably, east, and by the end of the month they were approaching, and in some places had already reached, the outposts of the Siegfriedstellung (Hindenburg Line). At which point a pause in proceedings was required for new troops and more material to be brought forward for the final assault on the extensive system of German defences. 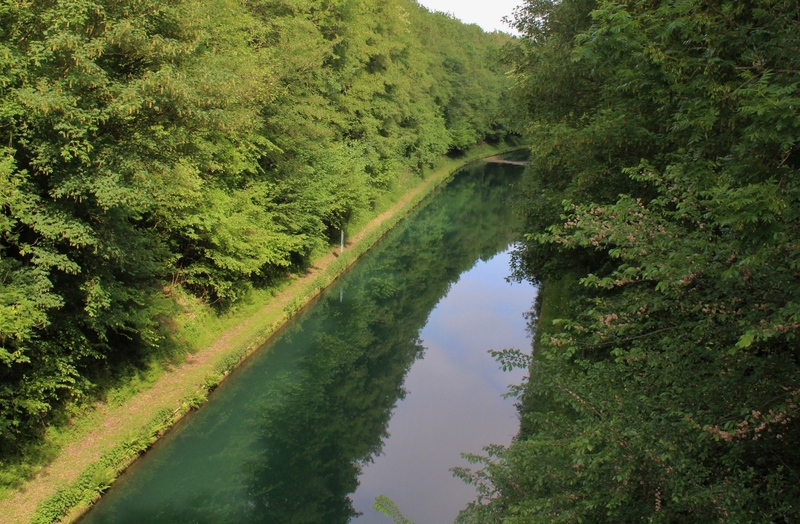 Along the stretch of the St. Quentin Canal facing Fourth Army, fresh Australian troops replaced exhausted ones, and a few miles further south the British 46th (North Midland) Division moved into positions vacated by the Australians, which is the area in which we find ourselves as we begin our exploration. The Battle of the St Quentin Canal would begin on 29th September 1918, exactly one hundred years ago today, British, Australian & American troops joining forces as part of the British Fourth Army commanded by General Sir Henry Rawlinson, supported by Third Army to the north, and the French First Army to the south, to attack the Germans with the intention of breaking the Hindenburg Line. 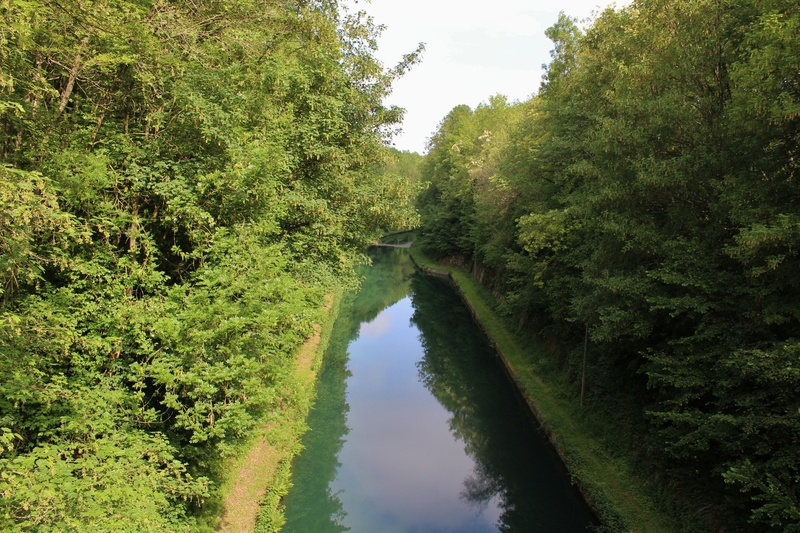 This attack would be made where, some six and a half miles north and a touch west of the outskirts of St. Quentin, the eponymous canal disappears underground for three and a half miles, just south of the village of Bellicourt. This trench map (not for enlargement purposes), the German trenches in blue, shows the area to be attacked on 29th September and I have marked the villages you will come across during the text. 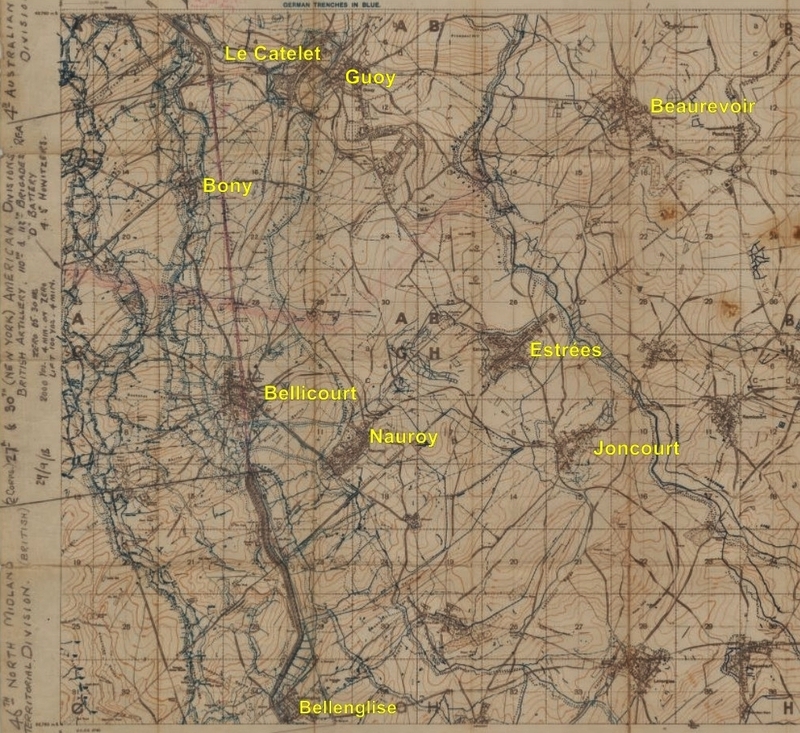 The four lines of German trenches are, from left, the Hindenburg outpost defences, the Hindenburg Line proper, the Le Catelet-Nauroy Line, and the Beaurevoir Line (the Hindenburg Reserve System) in the right half of the map. The divisions detailed to make the attack are annotated in pencil down the left margin as is each division’s front of attack, and an officer has at some point, handily for us, coloured the underground section of the canal in pink. 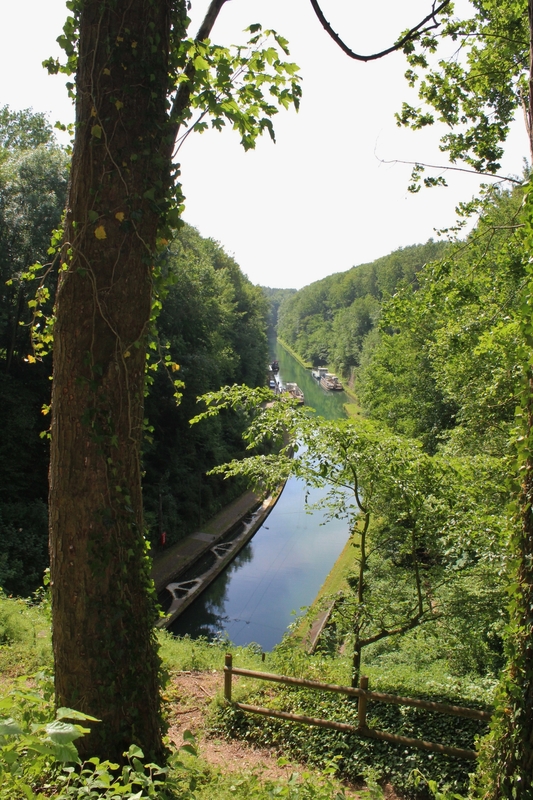 Note that the main German Hindenburg Line defences are to the west of the underground canal at this point; elsewhere, both to the north and south, the Germans left defensive outposts to the west, with the main defences to the east of the canal, incorporating the canal cutting itself as part of their defence system, as you can see in the lower half of the map. 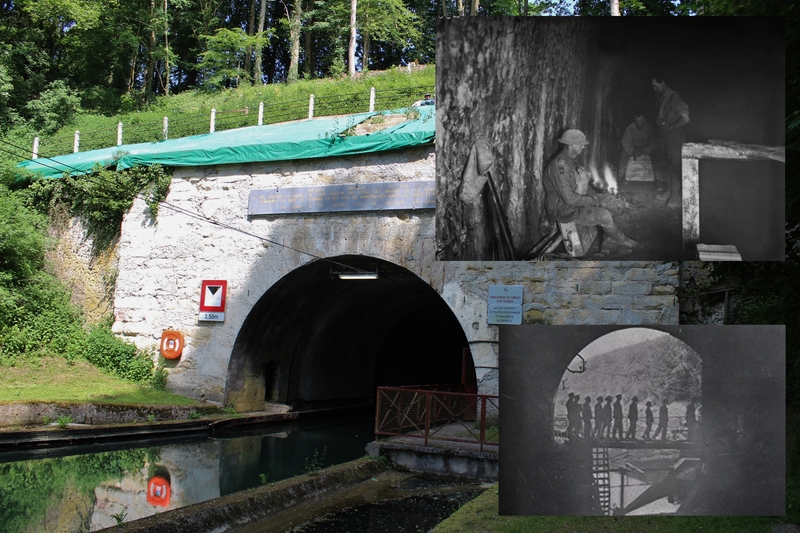 Our visit will take in just a mile or so of the attack, from the Riqueval bridge (square 22), immortalised post-war with the publication of one of the most iconic of all Great War photographs (later), north to where the canal disappears underground through the Bellicourt tunnel (marked as Riqueval, square 16). The German defenses are now back to red, indicating that this (and all following maps) are earlier than the previous one, and the map clearly shows the Hindenburg Line trenches to the west of Bellicourt at the top, and to the immediate east of the canal once it re-emerges, as far south as Bellenglise. 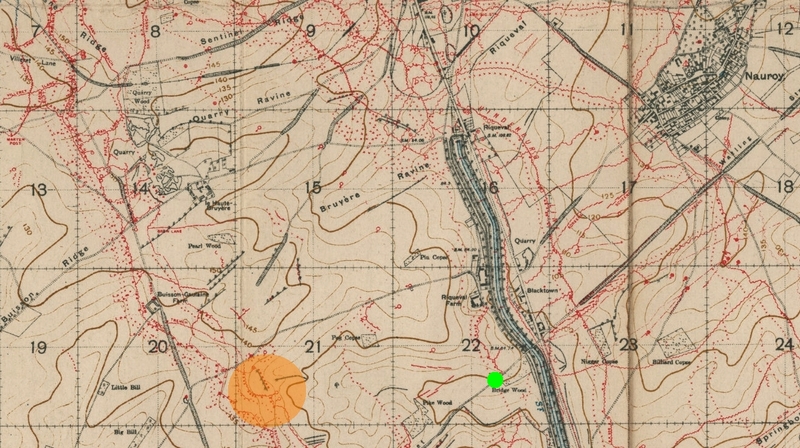 The Le Catelet-Nauroy Line, one of the Allied objectives of the day, is also marked in the top right. 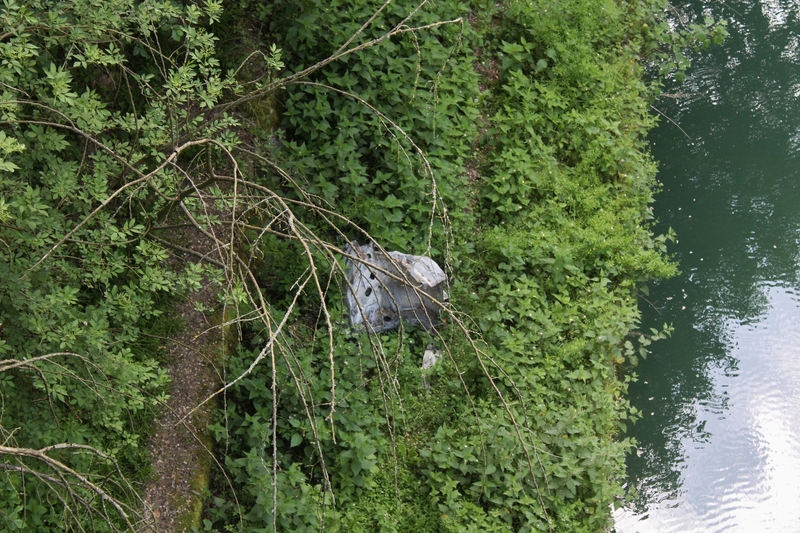 …this machine gun embrasure pointing straight down the canal to our south. 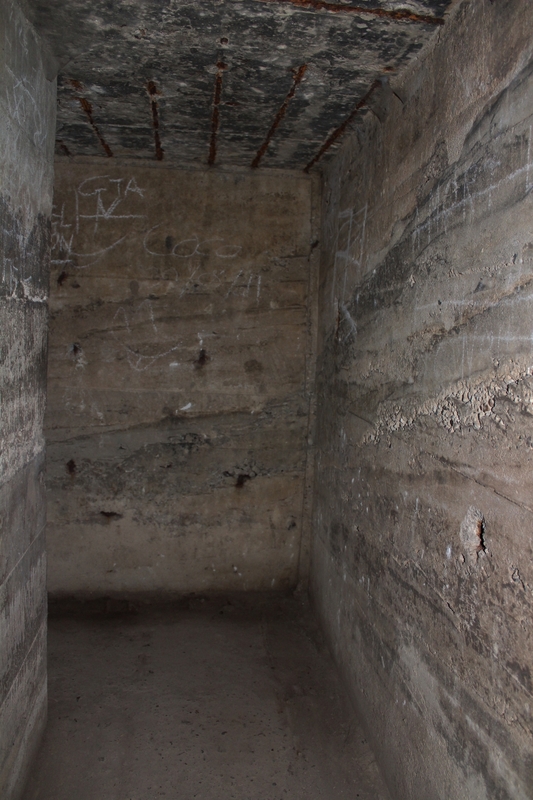 The embrasures in this bunker appear to have been blocked up at some post-war point, although as the bunker ages, and subsidence sets in, some of the cement has gone, re-opening at least this embrasure once more. 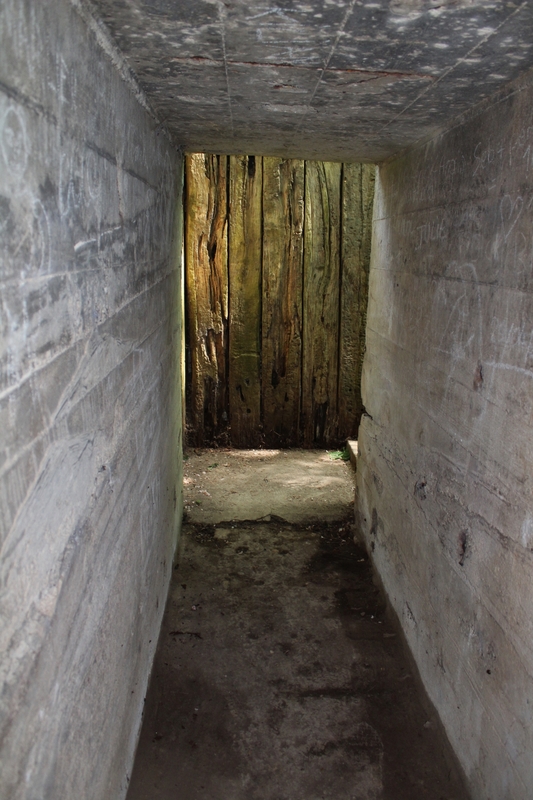 Look carefully, and from this side you will spot another embrasure, this time for a machine gun trained straight across the bridge. 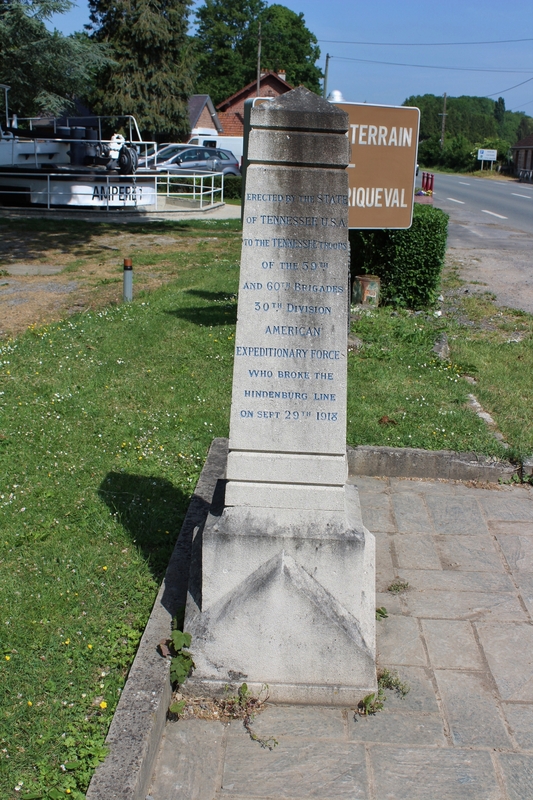 …erected by the Western Front Association in 1993, remembers the action that took place here, an action that we shall look at in more detail later in the post. It was Lieutenant General Sir John Monash and the Australian Corps, augmented by the American II Corps (the U.S. 27th & 30th Divisions – U.S. divisions were twice the size of British ones – were still, at this time, fighting under British command), who would lead the attack. Monash, believing, as did much of British High Command, that the Germans’ morale was at a low ebb, decided to use the inexperienced American troops to break through the German defences, with the Australians following up to exploit the breakthrough. 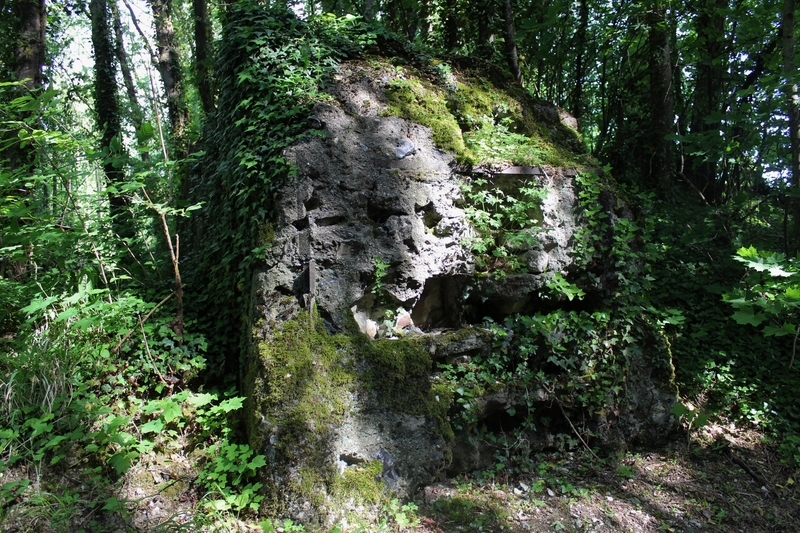 Monash intended to attack the Hindenburg Line where the St. Quentin Canal runs through the tunnel for some three and a half miles between Bellicourt and Vendhuile. 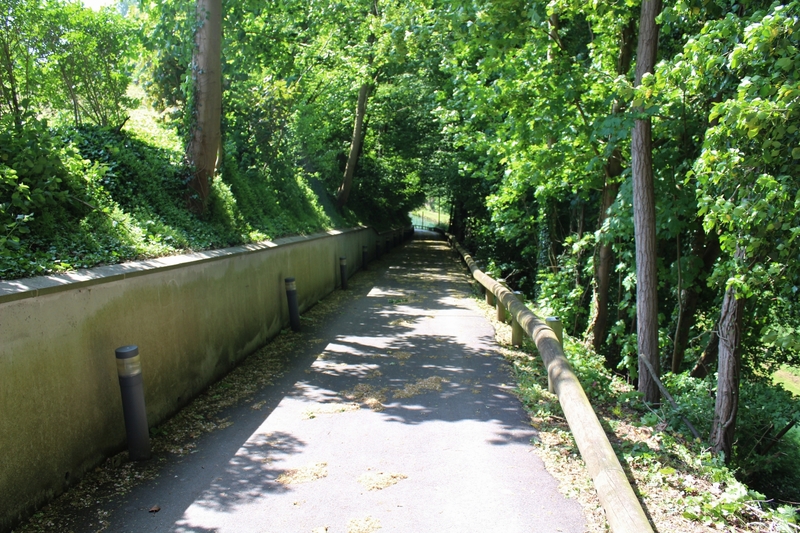 And, with the canal disappearing underground, this was the only section of the canal defences where tanks could be used. 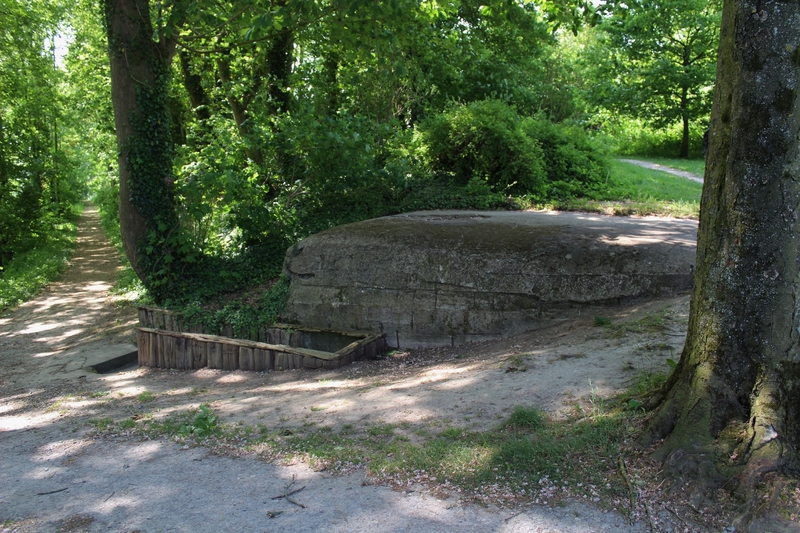 General Henry Rawlinson, commanding Fourth Army, and fresh from his successes at Amiens in August, made one change to Monash’s plans at the behest of Lieutenant General Sir Walter Braithwaite, commander of IX Corps; IX Corps, and specifically 46th (North Midland) Division, were tasked with attacking a short distance south of the Bellicourt tunnel, towards the Riqueval bridge and Bellenglise, a mile further south, directly across the canal cutting, a plan Monash himself had at no time considered, and which he thought foolhardy and doomed to failure. 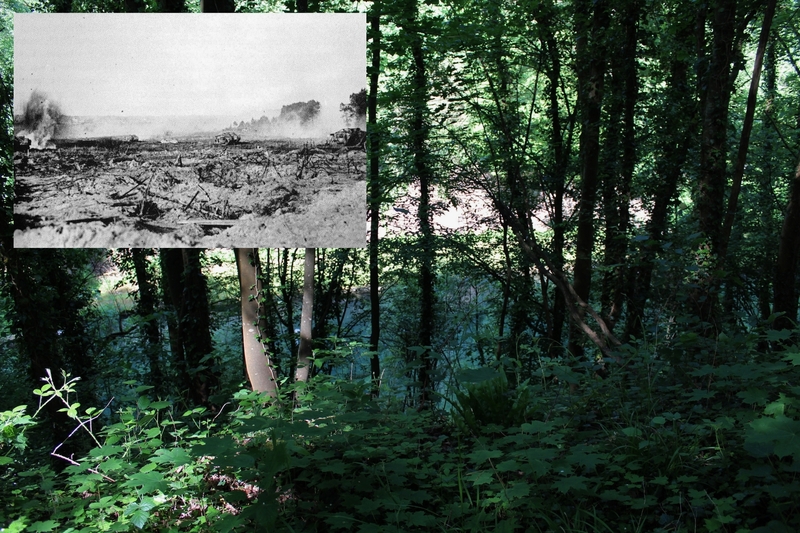 Monash’s plans were made on the somewhat hopeful assumption that the outposts of the Hindenburg Line to the west of the canal would have been secured prior to the assault; his plan included an American attack to capture them two days before the main assault, the Australians having already captured parts of the first line defences to the south, and so the American 27th Division were ordered to secure the outposts in the north before the main attack began, despite the fact that the British III Corps had already tried, and failed, the previous month. 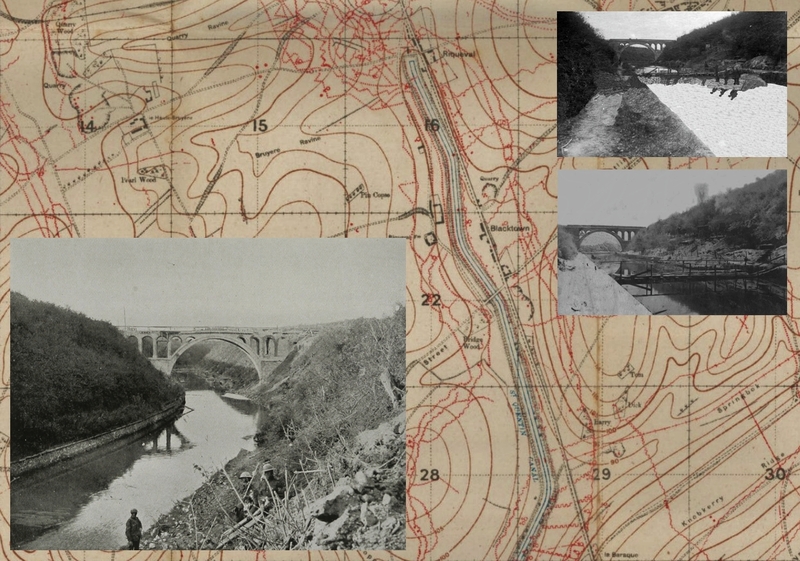 The map shows the main area of the American attack, with inset photos showing, from top, view of the canal north of the tunnel; machine gun emplacements at the top of the canal bank; Hindenburg Line trench; American troops follow the tanks near Bellicourt. 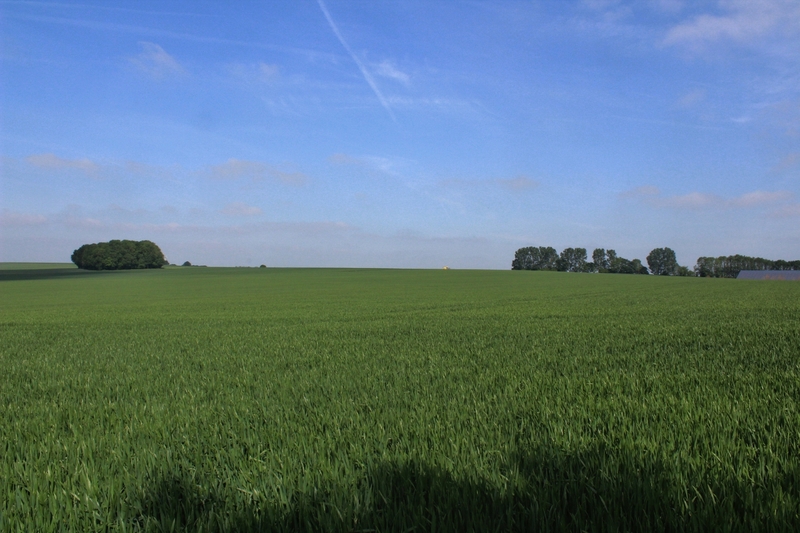 On 27th September 1918 the inexperienced Americans attacked, towards the Hindenburg Line positions marked in the top half of the map, immediately encountering resolute opposition, and although some German strongpoints were reached, they could not be held, and many of the Americans were forced back to their starting positions. With the artillery bombardment for the main assault two days later already under way, and with many other Americans missing and believed still to be somewhere between their starting positions and their objective, confusion reigned, Monash becoming so concerned at reports he was receiving that he asked Rawlinson for permission to delay the main assault. Rawlinson refused. Inset: Troops crossing the bridge after the battle. While chaos reigned to the north of the projected battlefield, the Allied artillery barrage continued. The main assault on 29th September was preceded by the heaviest British artillery bombardment of the war, for forty eight hours 1600 guns delivering a million shells, including 30,000 filled with mustard gas, being used for the first time by the British, and specially fused barbed wire busting high explosive shells. Monash intended his first objective to be to breach the main Hindenburg Line, before pushing east and taking the Le Catelet-Nauroy Line, and finally capturing the fortified Beaurevoir Line to the east (see far right of first trench map) as the final objective for the first day, although Rawlinson considered this final step to be too ambitious. And so it would prove. 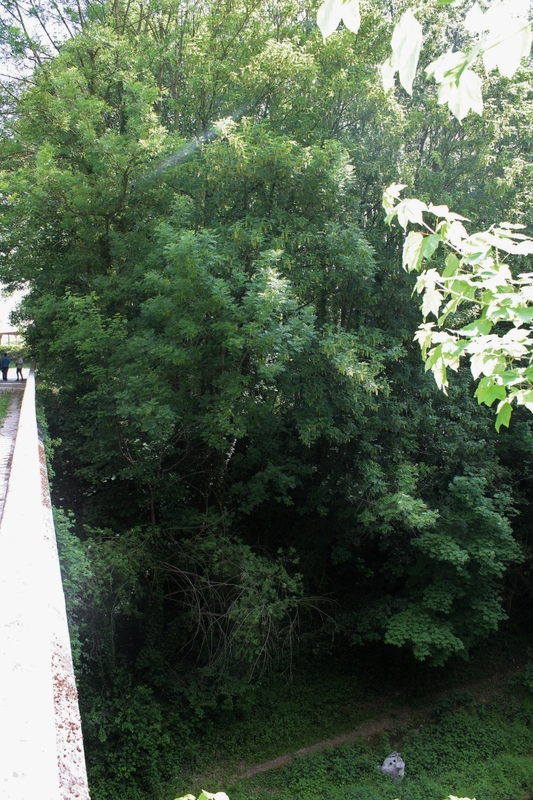 As we cross the bridge this view looks towards Bellenglise, a mile or so to the south; the top inset looks back towards the bridge from the bend in the main photo, the lower inset taken from where we are standing on the bridge – note the speedily constructed footbridges. To the north (see previous map), still unsure of the exact positions of the missing Americans who had attacked two days earlier, and with Rawlinson equally reluctant to change the barrage timetable at such a late stage, the creeping barrage would begin at a predetermined point based on the capture of the Hindenburg Line outposts which, as we have seen, had not occurred and was actually known not to have occurred – in actual fact 1000 yards ahead of where the American infantry would start from, leaving them horribly vulnerable to the German counter-barrage during their advance. 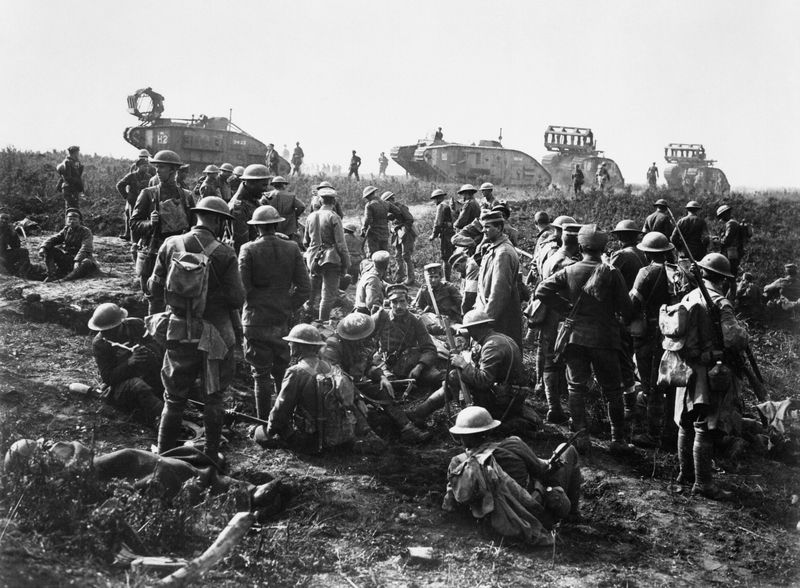 Rawlinson provided extra tanks to help alleviate this problem, but nonetheless the lack of a creeping barrage to protect the men of 27th Division would have serious consequences during the initial stages of the attack in the Australian and American sector. I have no idea what that might be. But we shall see it again later. Above & below: Still on the bridge, but now looking towards Bellicourt and the canal tunnel, about a mile away to the north. 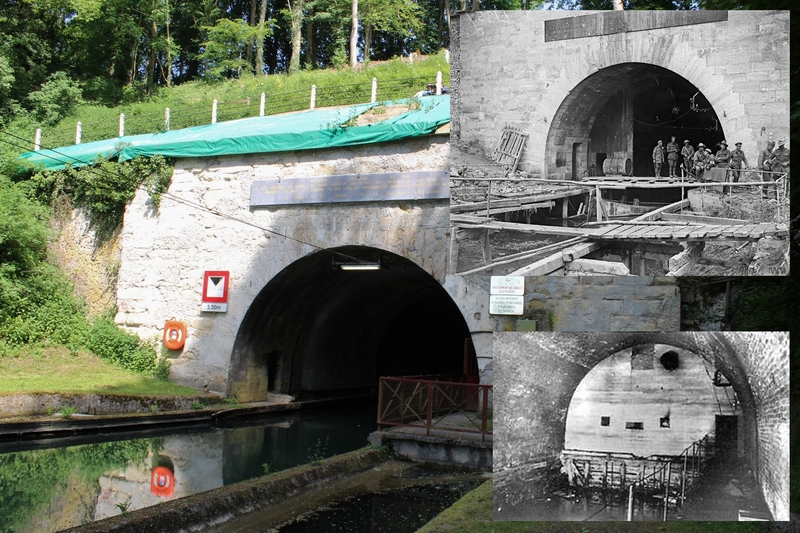 South of the tunnel, the canal facing 46th (North Midland) Division was a formidable barrier, as these photos show. 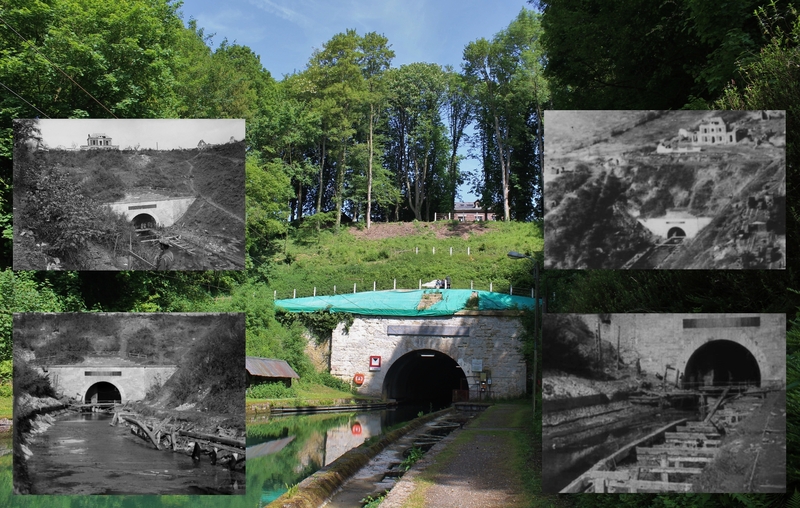 With almost vertical embankments rising to some fifty feet high as it neared the tunnel, and, unlike today, devoid of vegetation, thirty five feet wide, up to fifteen feet deep in places, the malodorous, stagnant, fetid waters of the canal and its steep sides appeared as a formidable barrier to the men of the 46th (North Midland) Division, as it was intended to be. 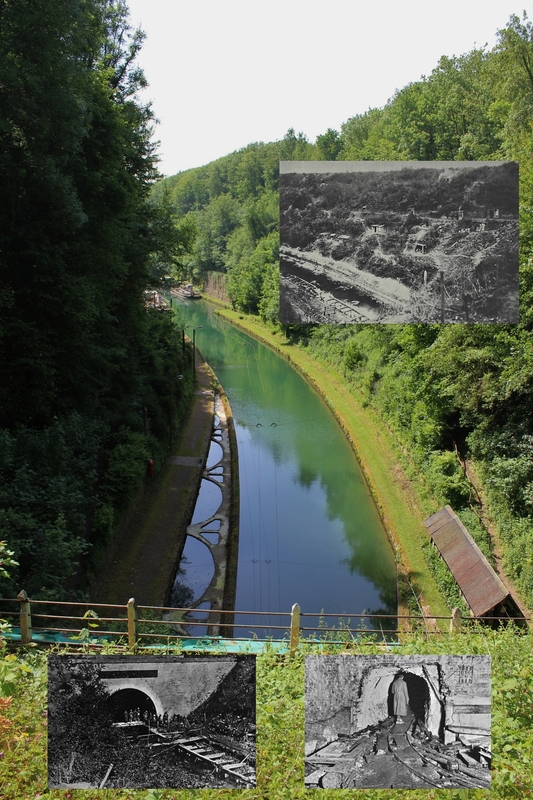 Barbed wire had been strung both beneath the water’s surface and across the embankments, machine guns, positioned in bunkers built into the canal’s eastern bank and connected by deep trenches, could sweep the opposite banks should attacking infantry breach the heavily armed outposts sited in the fields to the west, and German artillery had pinpointed all possible approaches to the canal. 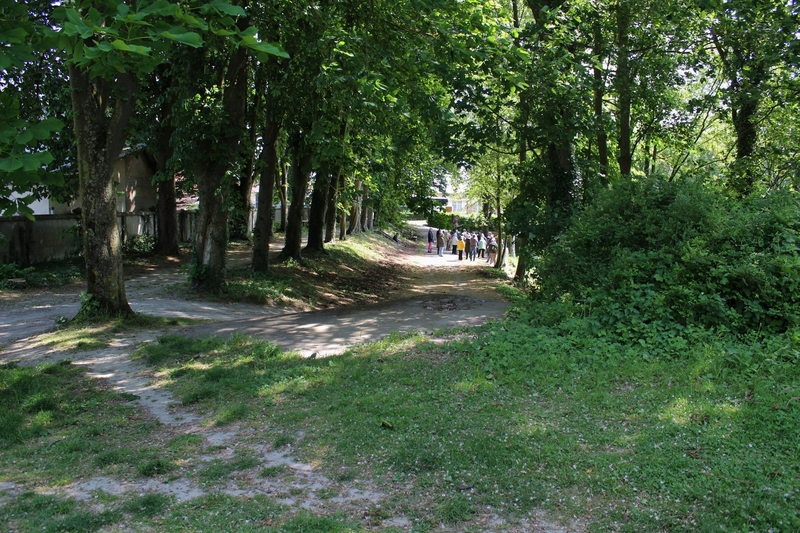 …as they advanced towards the canal, the passage of which is denoted by the tree line in the distance. 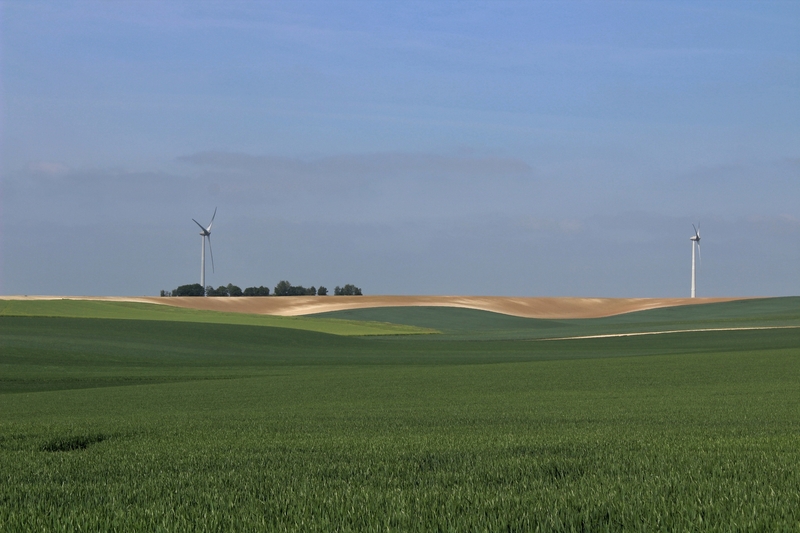 …the scars left behind by the Hindenburg Line outposts still plainly visible in the ploughed field, and again you may wish to refer to the orange circle on the trench map at this point to see if you can spot these actual defenses. 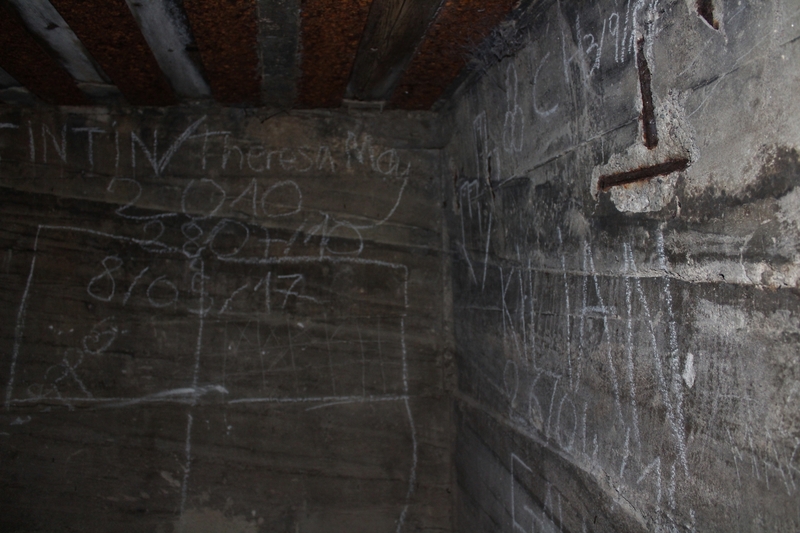 …all three woods marked on this trench map, with our rough position once more marked in green. 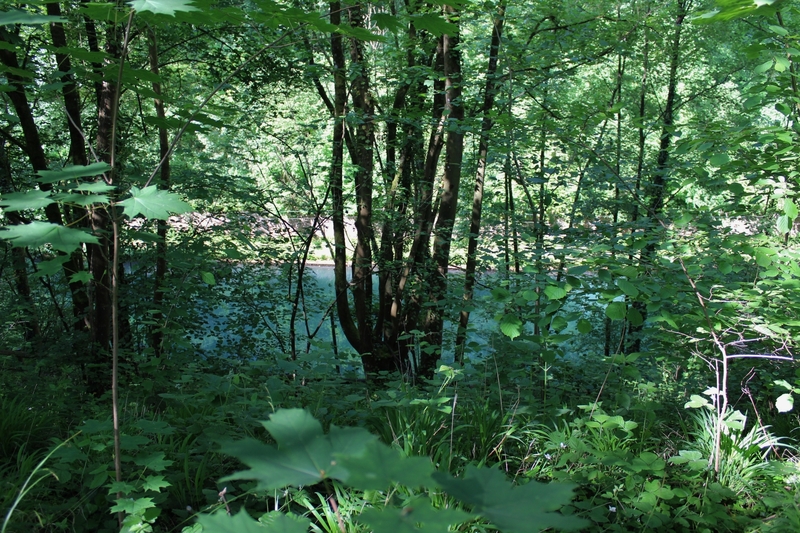 …and Pike Wood, although smaller now, still exist. 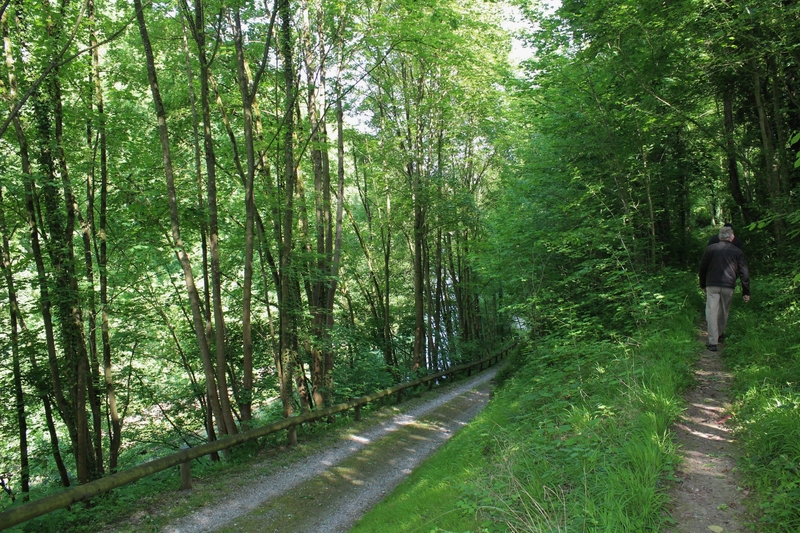 …and in this one north east, as the canal heads north towards the Bellicourt tunnel, Bridge Wood now on the right. Returning to the bridge, this the view the men of the 1/6th North Staffords would have had as they reached the still-intact bridge, and, as I mentioned earlier, we shall consider their achievements in more detail later in the post. 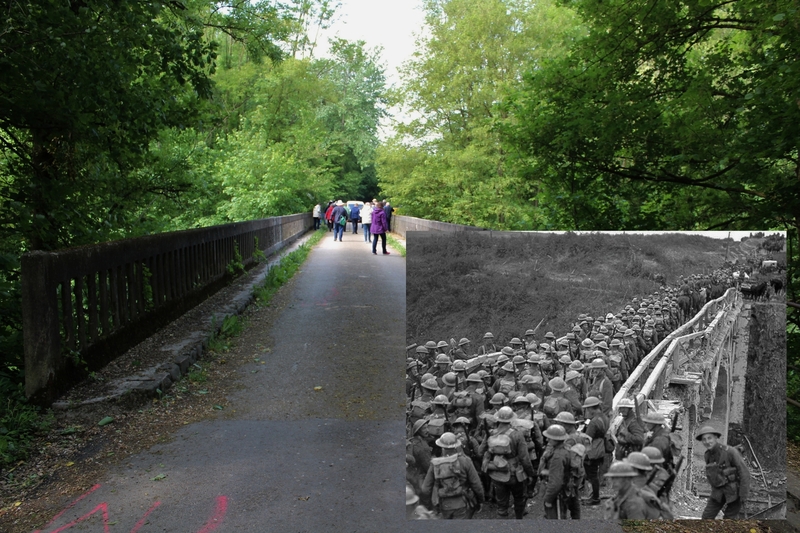 …conceal the location, as I mentioned earlier, of one of the iconic photographs of the Great War, men of 46th (North Midland) Division, some still with life jackets (inset top)*, line the canal bank after their succesful crossing to listen to an address by Brigadier General John Vaughan Campbell, V.C. 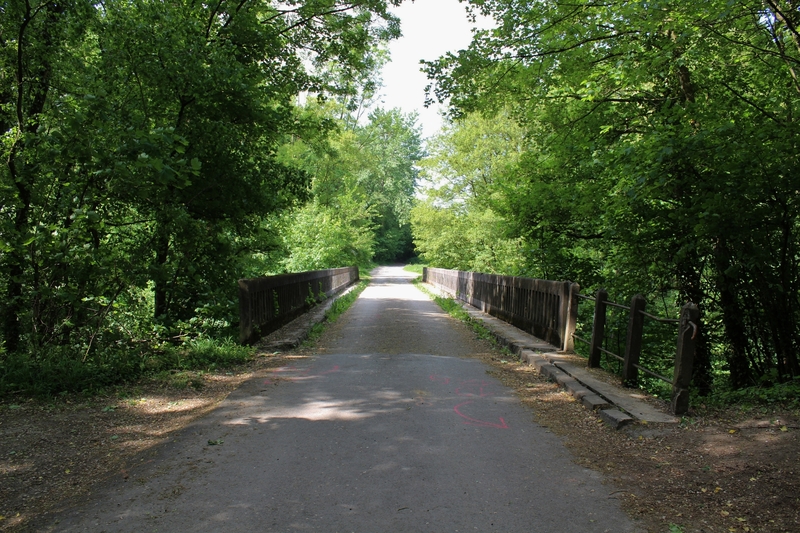 (the furthest left figure on the bridge, pointing at the camera). Campbell had been awarded the Victoria Cross for his bravery at Ginchy on 15th September 1916, where he ‘took personal command of the third line when the first two waves of his battalion had been decimated by machine-gun and rifle fire. He rallied his men and led them against the enemy machine-guns, capturing the guns and killing the personnel. Later in the day he again rallied the survivors of his battalion and led them through very heavy hostile fire. His personal gallantry and initiative at a very critical moment enabled the division to press on and capture objectives of the highest tactical importance.’ Campbell became known as the ‘Tally Ho’ V.C., the press reporting that he rallied his men by sounding a hunting horn and shouting the traditional hunting cry of ‘Tally Ho’. *all will be explained in due course. 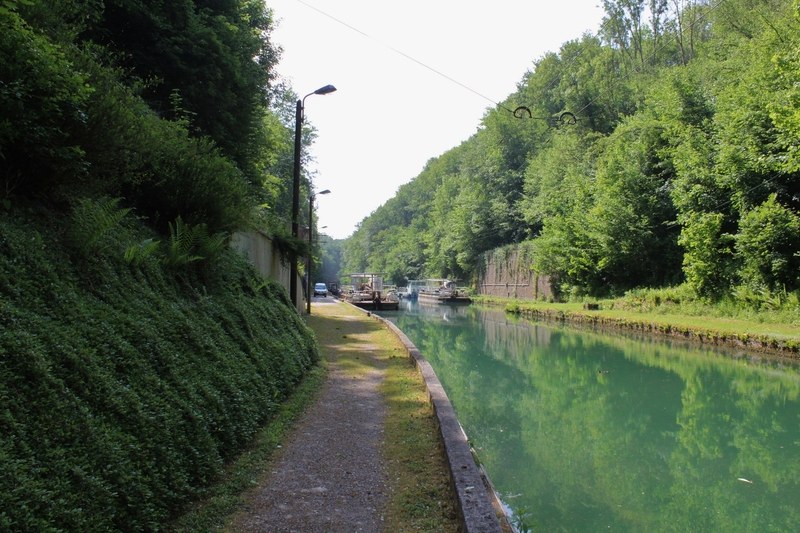 …and thus it was that just three of us embarked on the mile long walk along the canal bank from the bridge to our next stop where the canal disappears underground. And as we go, let’s continue our narrative. 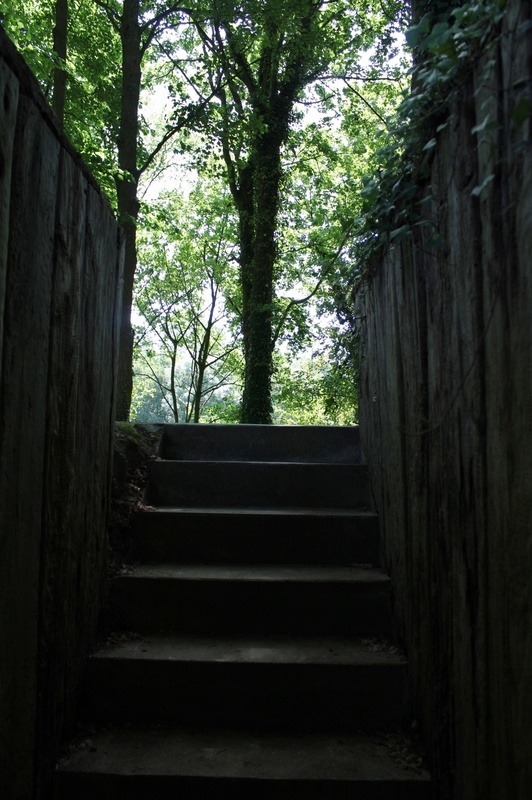 As dawn broke on 29th September 1918, a thick fog coated the fields in front of the two American divisions facing the Hindenburg Line, generally three lines of trenches and vast swathes of barbed wire, to the west of the St. Quentin tunnel. 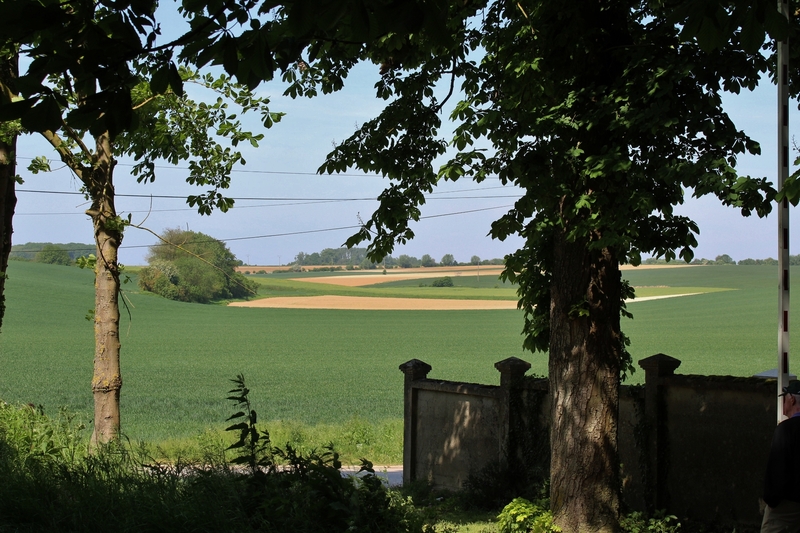 Furthest north, on the far left, 27th Division was still faced with the German strongpoints that their colleagues had failed to capture two days earlier, and yet Monash expected them to capture them, and the main Hindenburg Line, all without a creeping barrage to follow. The Australian Official History states, ‘The task thus allotted to the Americans by Monash was at least as great as any he had ever set for Australian divisions, if not greater. But the whole plan was based on the plan that the Germans’ morale was progressively falling’. Monash himself accepted he was asking the Americans to make ‘a deeper penetration than we have ever made before.’ But exactly how low had German morale dropped? Monash again. ‘For the first time I had to gamble on a chance. It was contrary to the policy which had governed all my previous battle plans, in which nothing had been left to chance.’ The whole question of morale is a book unto itself, but there is no doubt that some Germans, particularly the machine gunners, fought to the very end, and others gave up immediately, sometimes in their hundreds, as the attacking infantry appeared through the fog. And it is my personal belief, strengthened all the more since seeing the terrain in person, that it was the fog, more than morale, that proved the decisive factor on the day. The Americans’ objective was the Le Catelet-Nauroy Line, east of the canal, at which point the two Australians divisions, following behind, would take over, leapfrogging through them to attack and capture the Beaurevoir Line further east. Support would come from approximately 150 tanks, including some from the American 301st Heavy Tank Battalion, British tanks crewed by Americans. The inset purports to show four of the American H.T.B. Mark Vs in action. …an American eagle adorning its face. The narrative continues. As the battle began, on the left the American 27th Division unsurprisingly had a torrid time, gaining precisely none of their objectives that first day, a day on which saw 107th Infantry Regiment suffer the worst casualties sustained by any U.S. regiment during the war. The Australians, following behind, had no chance of attacking their own targets, and became embroiled in a vicious fight for positions that the plan of attack dictated had already been captured two days before. This lack of progress to the north had an impact on the attack to the south, where things had begun better as the attacking troops here could keep closer behind the creeping barrage. The Americans of 30th Division moved ahead of their colleagues to the north and began taking casualties from enfilading fire from their left, and, before long, from the rear, the fog leaving unseen pockets of Germans who, by-passed by the inexperienced attackers, were now causing havoc. Soon, in the fog and smoke and among the vast swathes of barbed wire protecting the German trenches, they began to lose momentum, small, directionless, parties of men appearing out of the fog as the Australians, following behind to leapfrog them once their objective had been achieved, found themselves in action far sooner than anticipated. The day then descended into one of savage, desperate, fighting (few German morale problems here, it would seem) as German resistance stiffened. 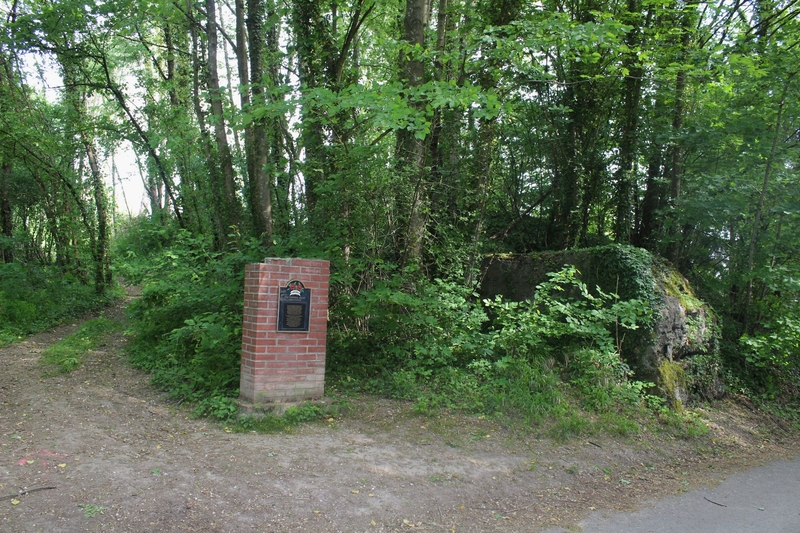 By day’s end, although the Americans and Australians did succeed in fighting their way through the Hindenburg Line and capturing Bellicourt, advancing considerably further than the 27th Division on their left, and linking up with IX Corps, who had attacked across the canal south of the tunnel entrance on their right, they were still well short of their intended objectives. The fog caused no end of problems for the tanks, too, communication with the infantry being seriously impaired by the conditions, German anti-tank defences proving to be stronger, and defensive tactics better, than during the battles of August, many tanks being destroyed or disabled during the course of the day. Of 141 tanks (Mark Vs & Whippets) that entered the fray on 29th September, no less than 75 became casualties of battle or broke down, including eight destroyed in an old British mine field (both sides by now using land mines for defensive purposes). This photograph, taken on 29th September, shows Americans of 30th Division with German prisoners, tanks moving up in the background. These are Mark V tanks, equipped with Cribs, a lightweight version of the fascines that tanks had previously carried, to enable them to cross the wider trenches that the Germans had incorporated into their defences for precisely that reason – to stop the tanks. The second tank, you will notice, carries no Crib, and with good reason; this is a Mark V* (referred to as a Mark V-star), a Mark V extended in length by six feet by adding three extra panels amidships. 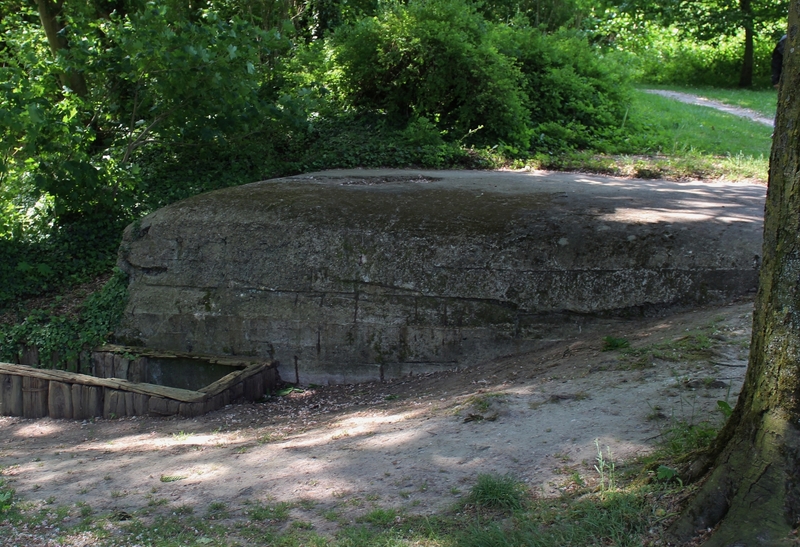 Hence no fascine required, the extra length allowing these tanks to cross trenches eleven or twelve feet wide. 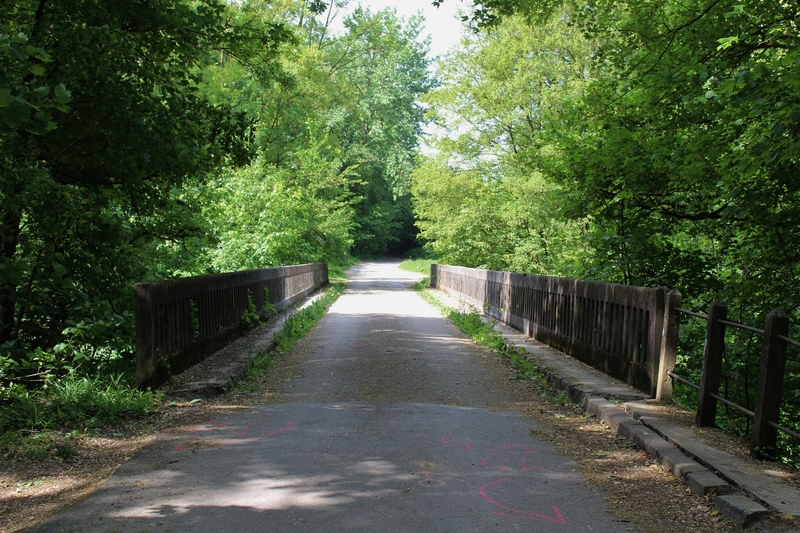 …and this the scenic route. 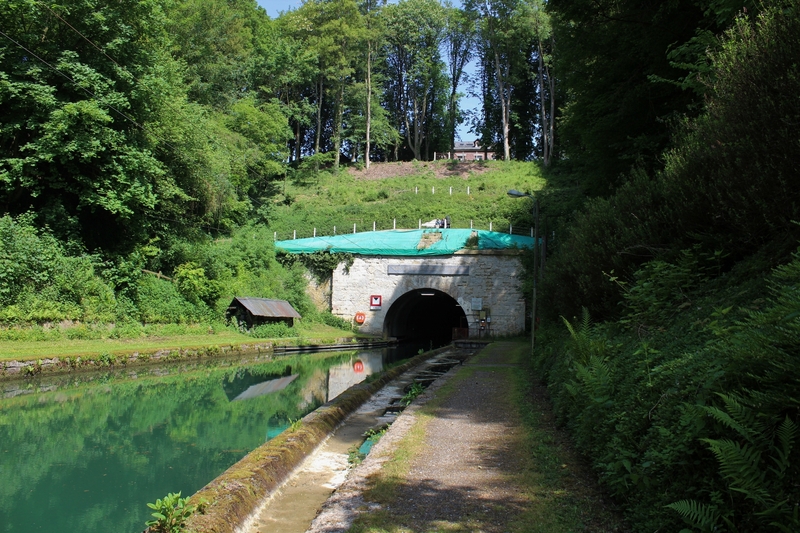 Either way, on reaching the bottom we find ourselves staring at the mouth of the Bellicourt tunnel, three and a half miles long and, at the time of its opening, the longest canal tunnel in the world. 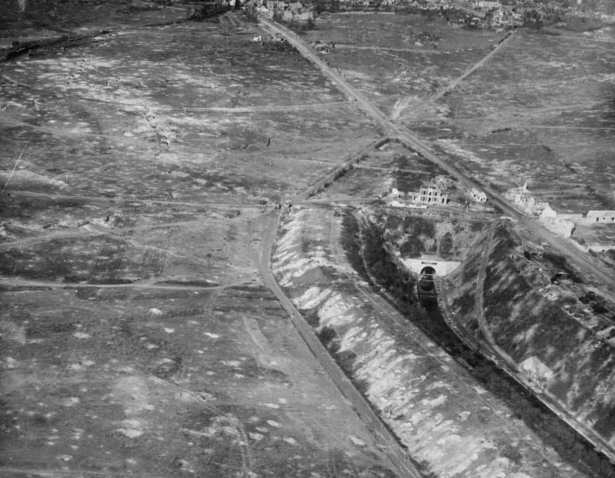 Fabulous aerial shot showing the tunnel entrance, the village of Bellicourt at the top of the picture. 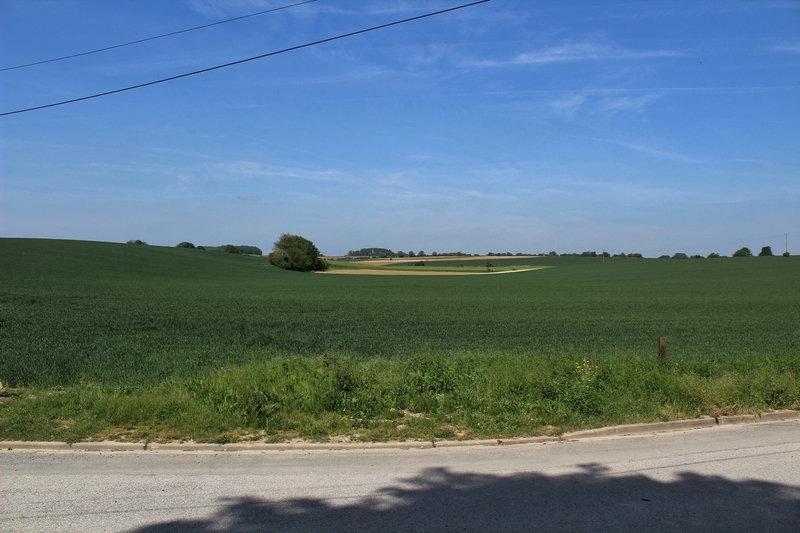 The Hindenburg Line defences can be traced across the picture, from the eastern canal bank on the far right, to the building above the tunnel mouth, and then continuing to the west of the underground canal across the fields towards the top left corner. 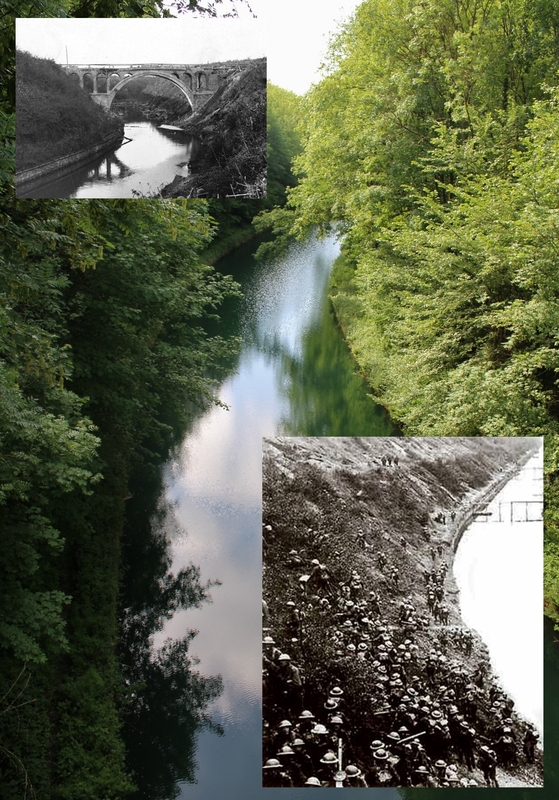 Note that my ‘quick way’ down the eastern canal bank, from a few photos back, was there a hundred years ago, and I think I can just make out the zigzagging ‘scenic route’, too! 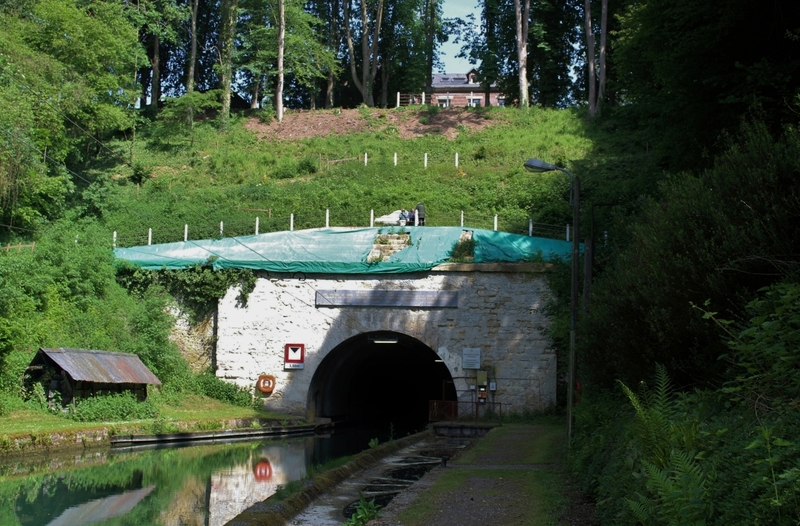 Ground level shot showing the same section of canal, the building above the tunnel entrance in the centre. 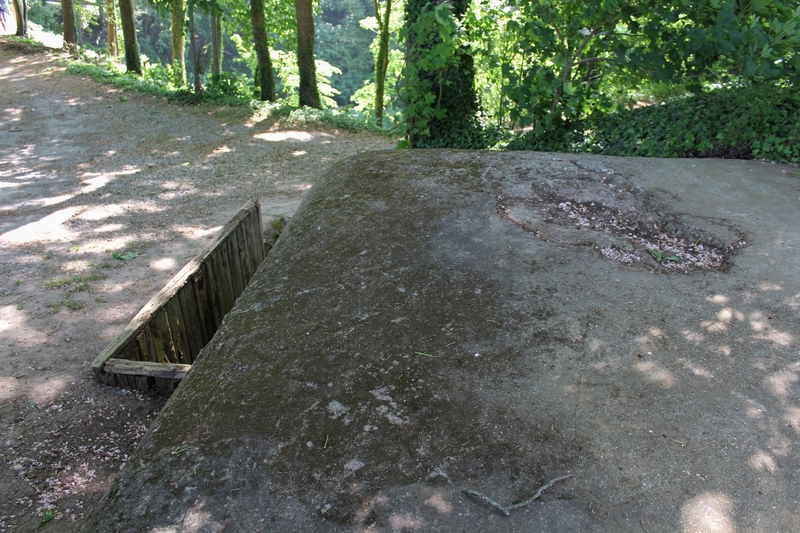 Note the brick lining to the actual waterway itself, another obstacle the attacking troops would have to overcome. …and the view looking south, back the way we have come; although looking the other way, compare this view to the one four photos back. 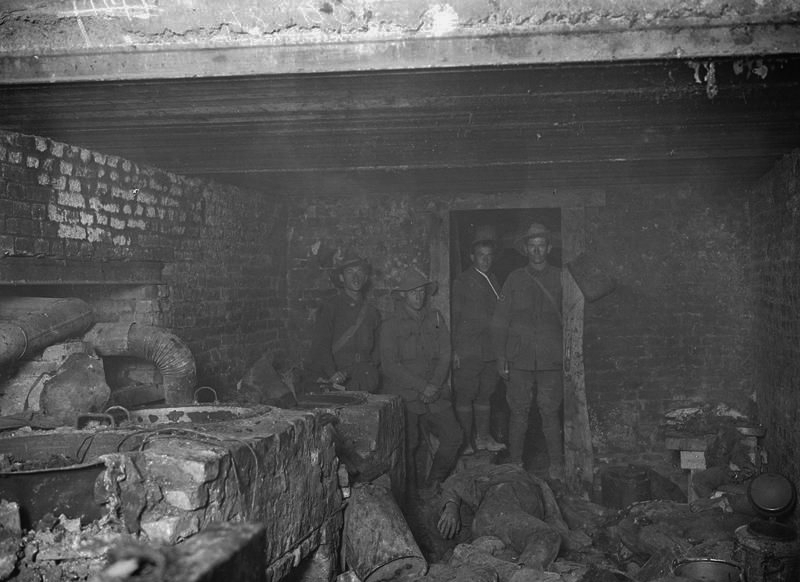 Australian & American troops at the tunnel entrance after the battle (inset top). 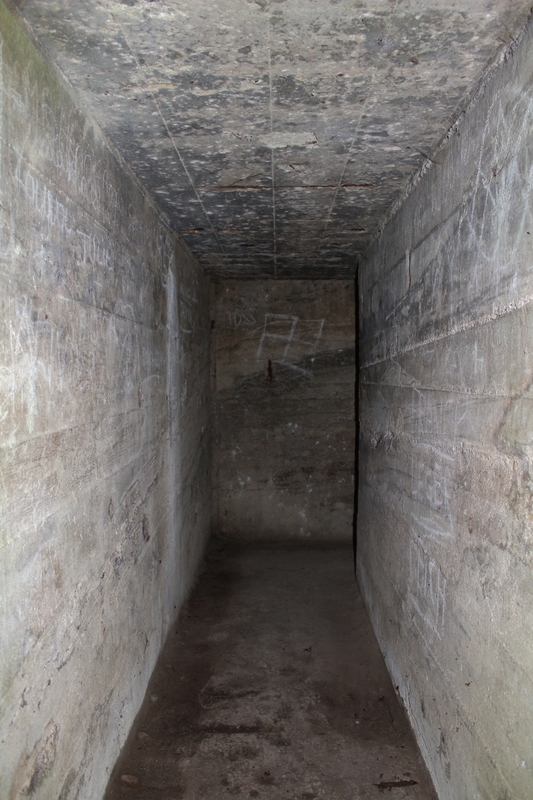 The Germans had blocked the tunnel a short distance inside the entrance (inset bottom) – note the machine gun embrasures. 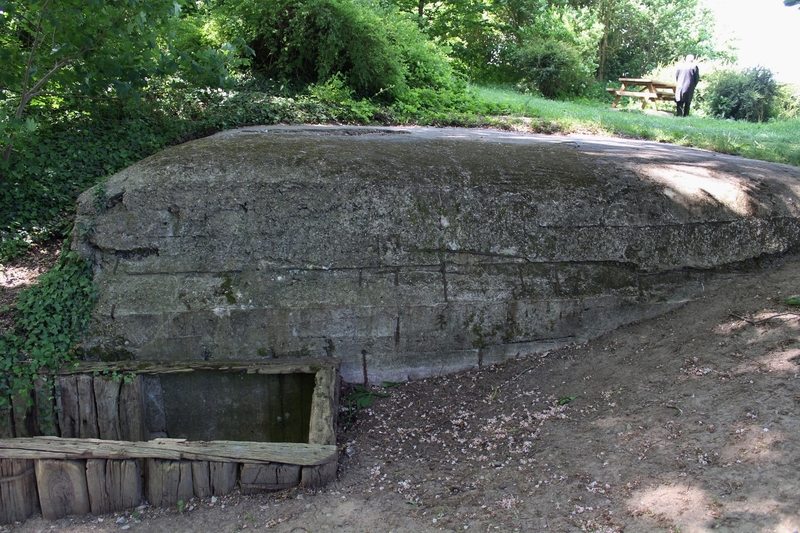 At some point during the battle a 6-inch shell pierced the bank above the machine gun and penetrated as far as a chamber below being used as a cookhouse (gossip at the time among Allied troops suggested it was actually a human boiling factory) before exploding. Of course it wasn’t a human boiling factory, but it became one, in a way, at the time of the explosion. 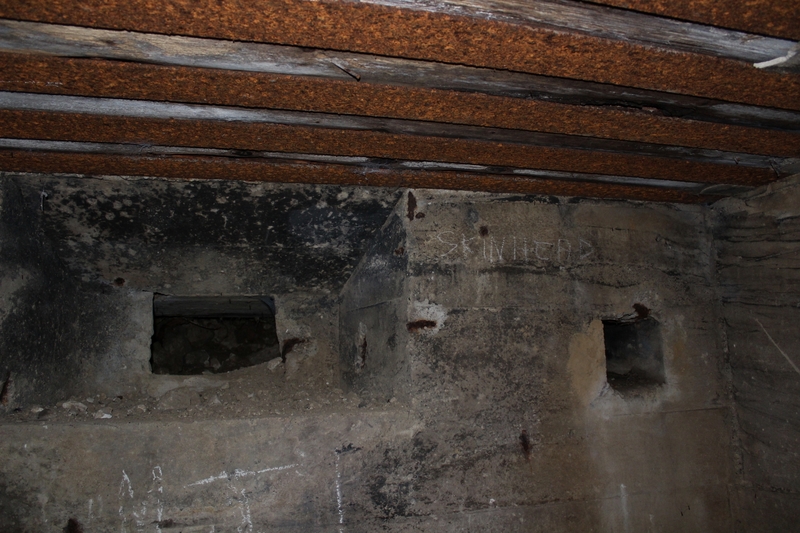 The inset photo shows the point of impact, the machine gun embrasure, three machine guns still protruding (but the soot around them tells of a serious fire within), in the bottom right. Carnage inside the cookhouse. At least three Germans lie dead, although you might not wish to look too closely. 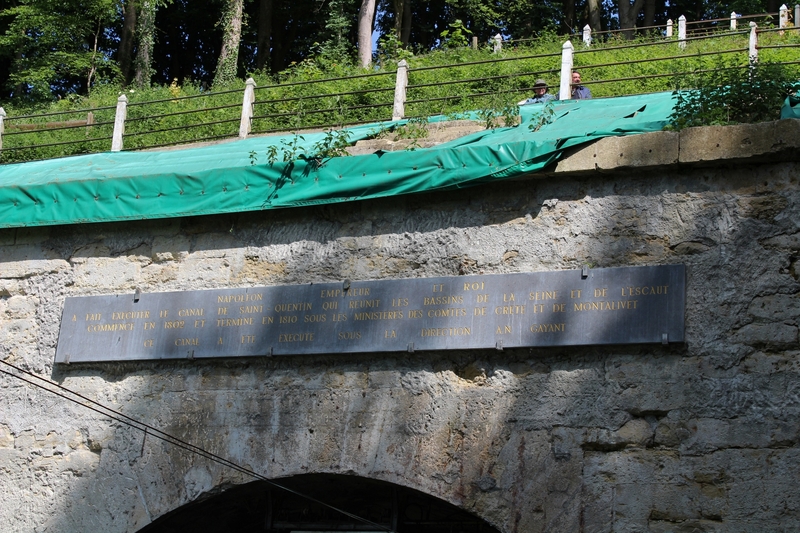 Napoleonic plaque above the tunnel entrance. 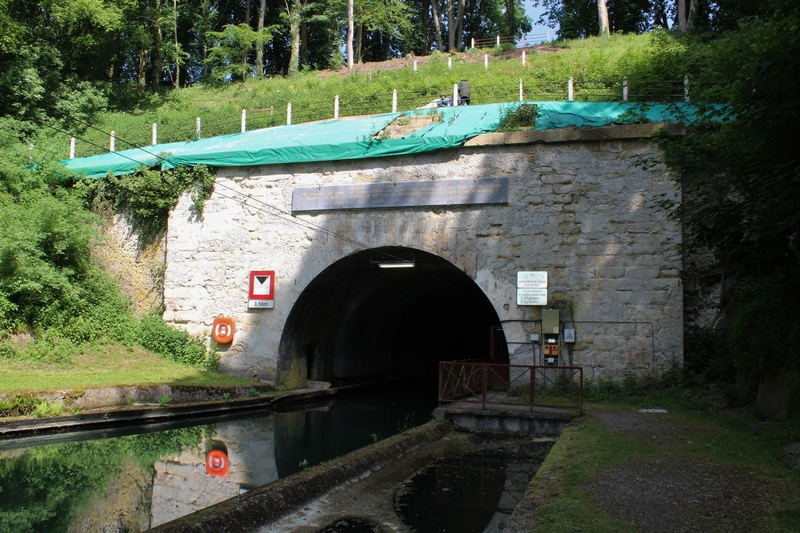 The tunnel is still in use today, one of the last locations in the world where a chain boat still pulls you through the darkness. Provided you too have a boat. 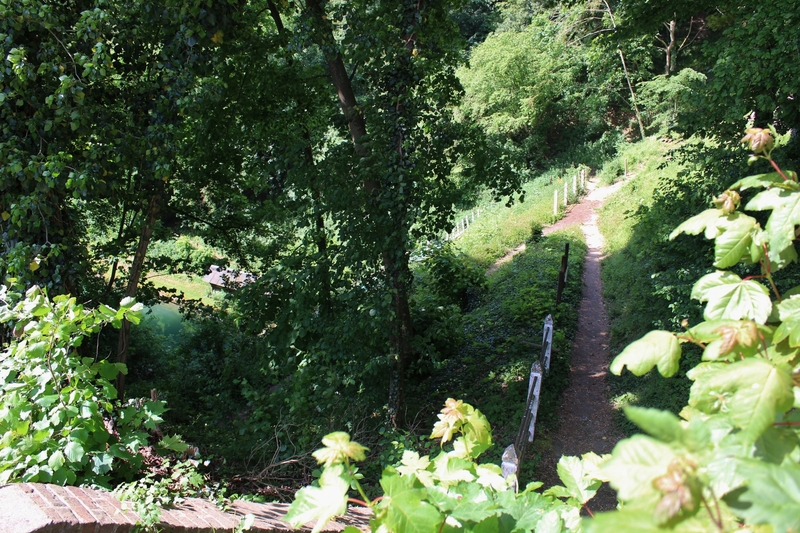 …back towards the Riqueval bridge. 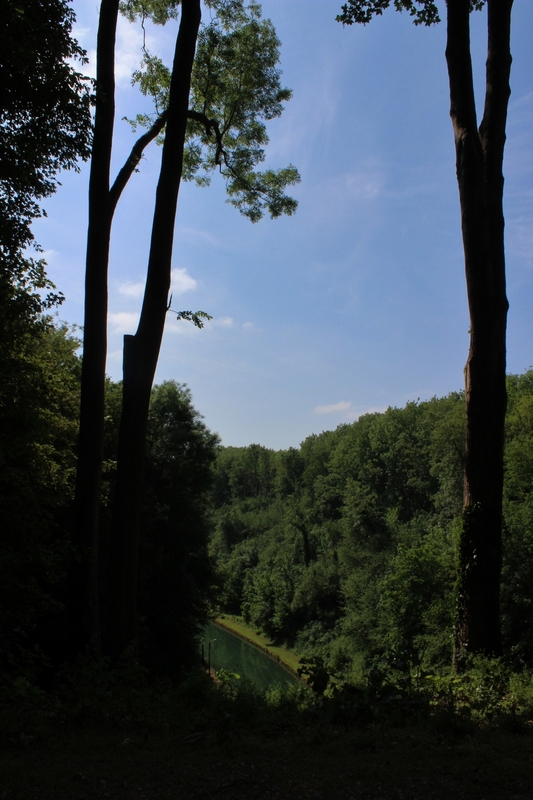 Views like these show how difficult it would have been for the British to negotiate the western bank of the canal, clear of vegetation, of course, and then cross the water, had the German machine gunners enjoyed the views we have today. And had the fog been absent. 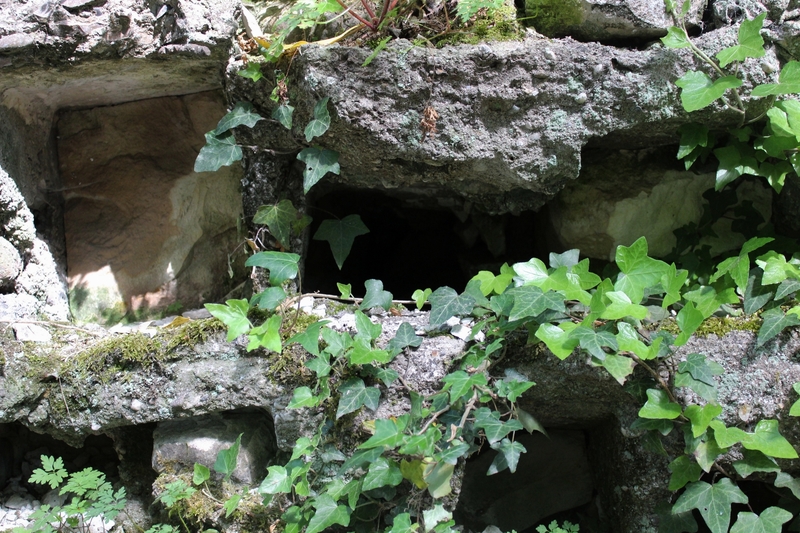 …close to the tunnel entrance. 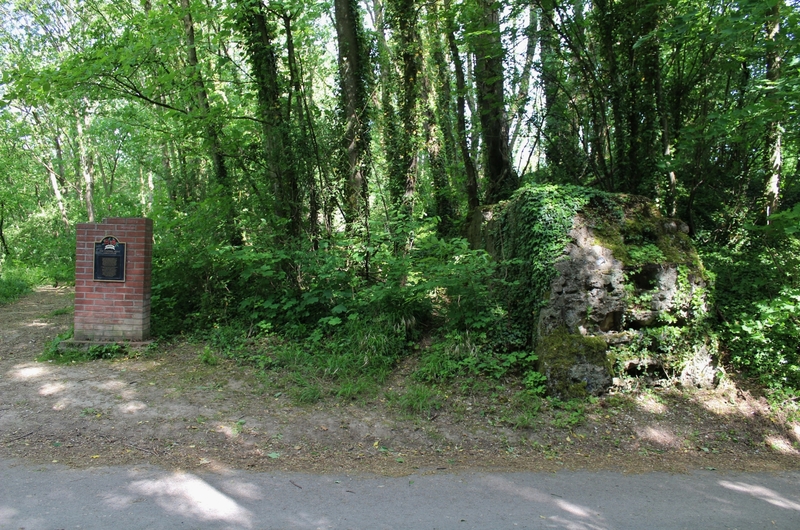 Just to re-iterate, the first bunker we saw at the Riqueval bridge was positioned on the eastern side of the canal, as were the main Hindenburg Line defenses south (and north) of the three mile tunnel, but here, at the tunnel entrance, the Hindenburg Line defenses switched to the west bank, hence the positioning of this second bunker and the others that were once nearby. …although please bear in mind that this and the following pictures are all taken in total darkness and with crossed toes. 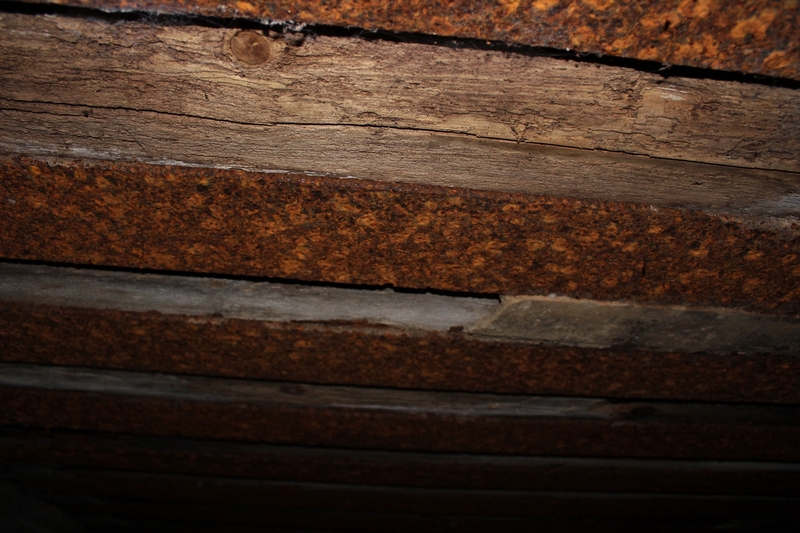 …and above us the roof timbers still look half decent. …we continue our narrative. 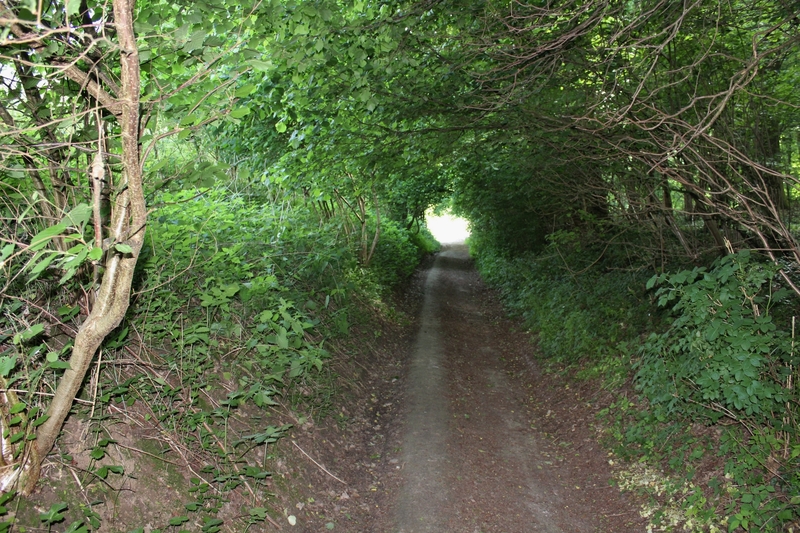 South of the tunnel, on the right of the American and Australian Divisions, and following an even more enormous artillery barrage than that laid down further north, IX Corps, and more specifically 46th (North Midland) Division, were tasked with the attack, spearheaded by 137th (Staffordshire) Brigade. 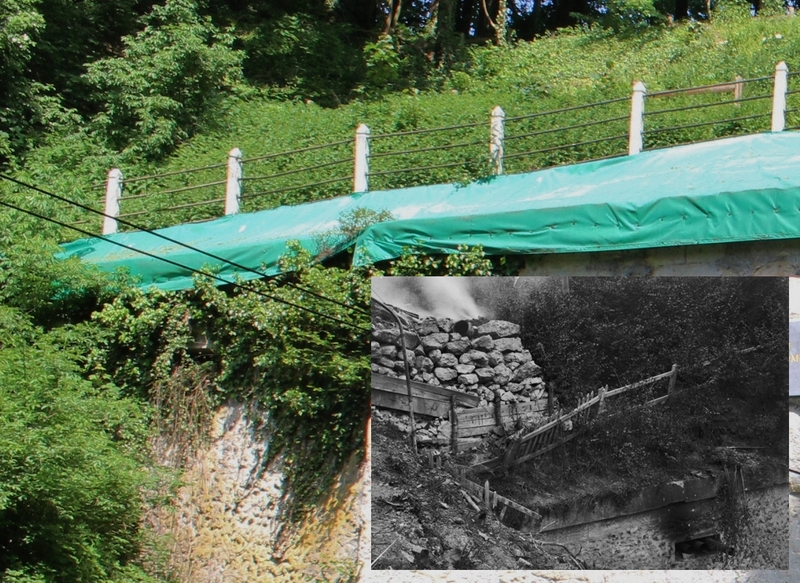 Three battalions would be involved, on the left, and including the bridge at Riqueval, 1/6th Bn. North Staffordshire Regiment, in the centre, 1/5th Bn. 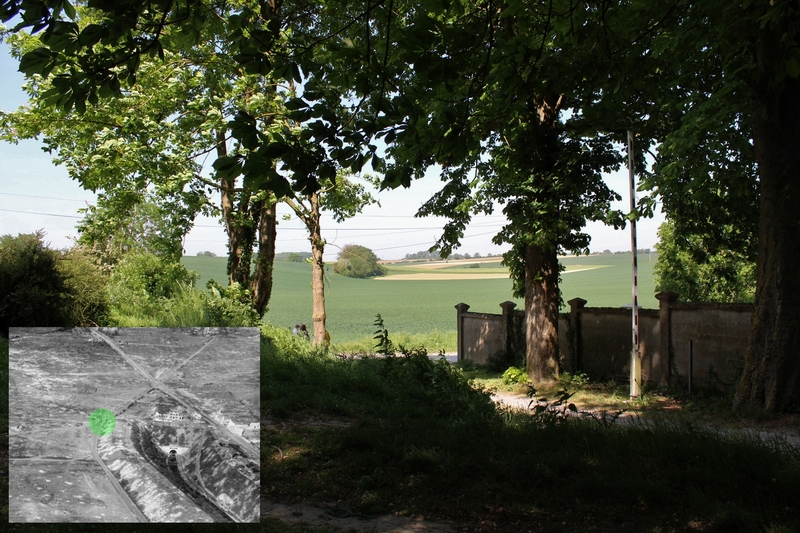 South Staffords, and on the right, opposite Bellenglise, 1/6th Bn. South Staffords. At 5.50 a.m., amidst the thick fog and the smoke of the bombardment, the men of the Staffordshires attacked, fighting their way through the outlying German positions to the west of the canal and scrambling down the canal banks, the devastating artillery bombardment that preceded the attack keeping many of the defending Germans hunkered down in their dugouts, the fog reducing visibility to just a few yards and ensuring that those Germans who were in position to defend were unable to see what was happening on the opposite canal bank. 1/6th Bn. 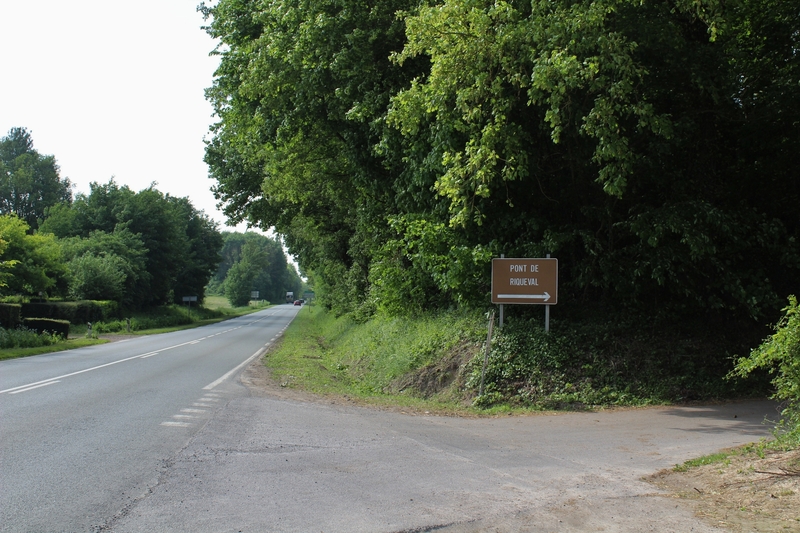 North Staffords attacked on a front of some 800 yards, which included the Riqueval bridge, the main supply route for the German troops defending the outposts on the west of the canal. 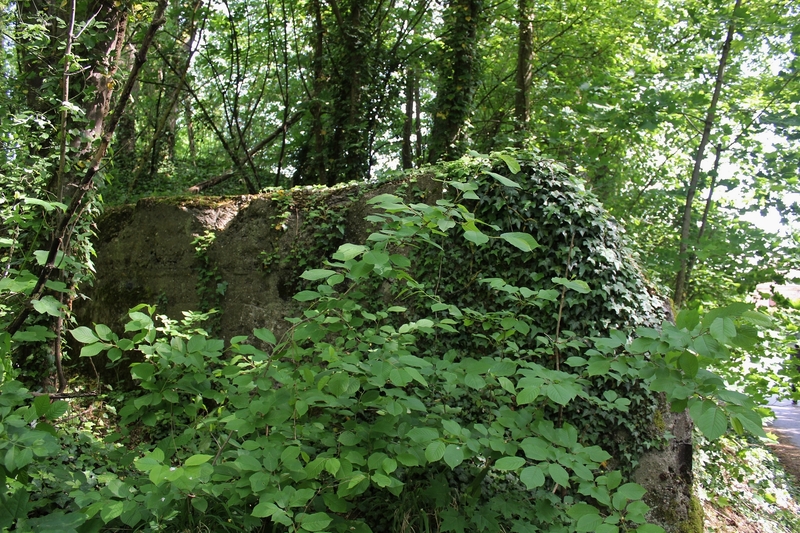 As the British artillery bombardment rained down on the Germans across the canal, and with reports suggesting that the bridge was still standing on the previous day and perhaps was still intact, Lieutenant (Acting Captain) Arthur Humphrey Charlton led a party of nine men from ‘A’ Company through the fog, using compasses to find their way, towards the bridge in an attempt to capture it. A machine gun in a trench (easily spotted on the trench maps) defending the western approach to the bridge was neutralised, the gunners all bayoneted, before the outline of the bridge, still indeed intact, could be discerned through the fog and smoke. 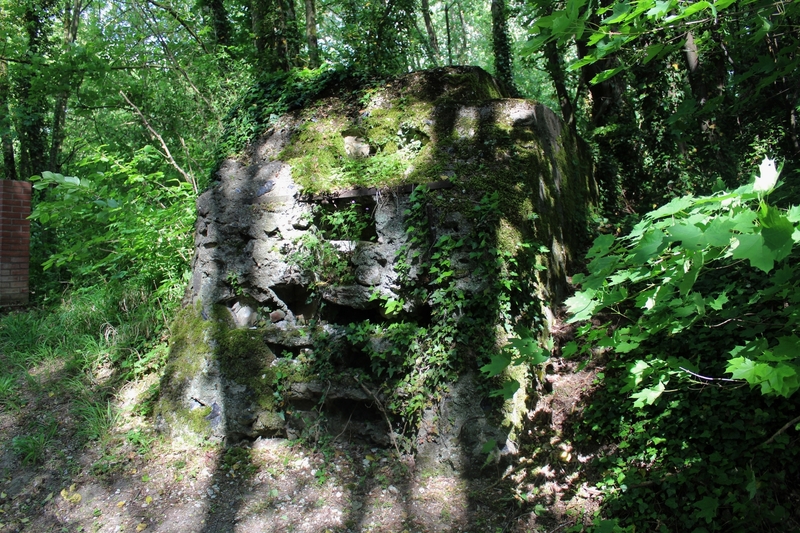 Then began a race between the attacking North Staffordshires and the German sentries and pioneers detailed to destroy the bridge, but who were currently hunkered down in bunkers on the east side (quite possibly some were squeezed into the bunker we saw at the very start of the post, alongside the machine gunners), sheltering from the British barrage. The North Staffs won, Captain Charlton cutting the leads and throwing the charges in the canal while his men dealt with the Germans. 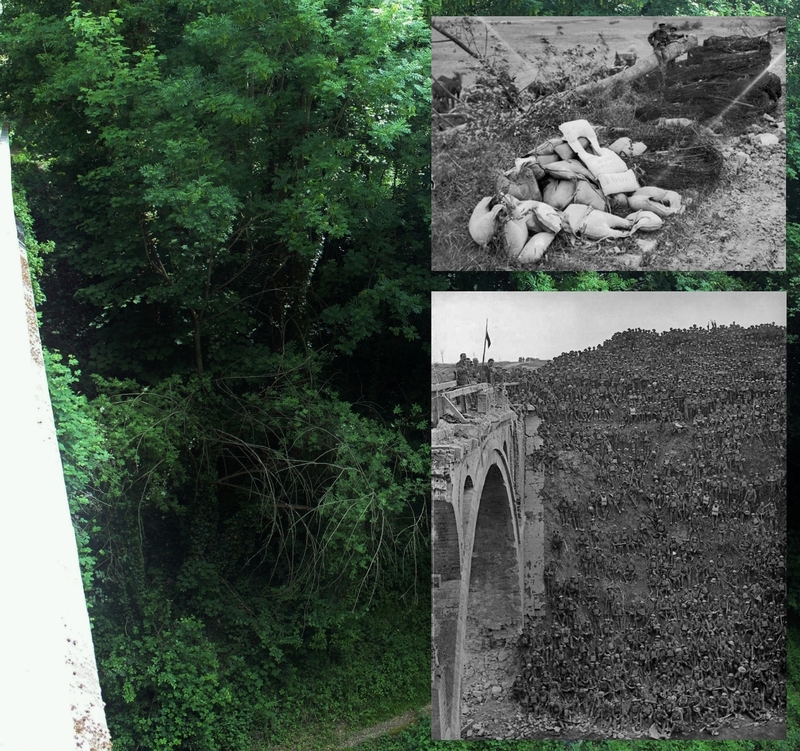 Within minutes the remainder of his company charged across the bridge, mopping up any remaining Germans on the eastern bank. 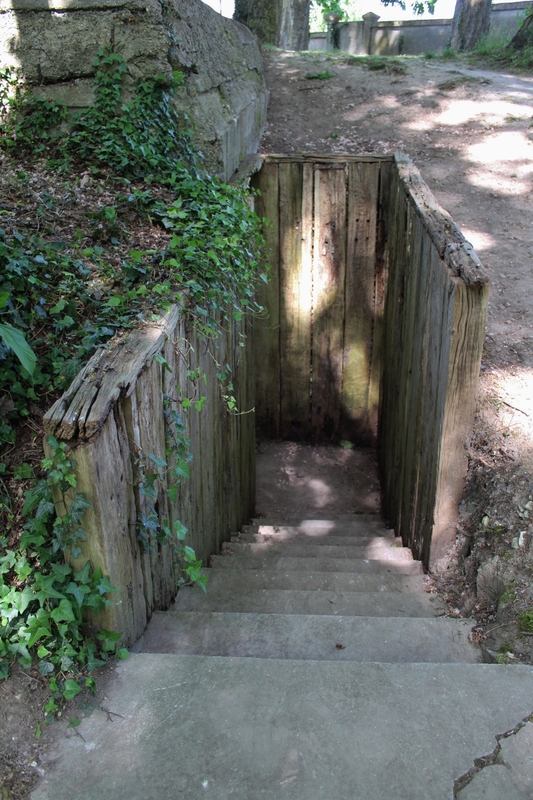 A couple of small wooden German footbridges were also found intact, allowing the whole battalion across the canal in double-quick time and, after a short pause to reorganise, attack the Hindenburg Line trenches in front of them. All along the front, pre-constructed devices for crossing the canal, including collapsible boats, floating mats made of petrol cans and cork floats and 3,000 life belts procured from cross-Channel ferries, had been provided by the Royal Engineers, and scaling ladders were brought forward to climb the brick wall lining the canal. In some place officers simply swam across with rope lines, the men following on wooden rafts or simply pulling themselves along the ropes. Despite the German machine gunners and bombers on the eastern bank, the fog and smoke made accurate defensive fire impossible at anything but point-blank range, and as pockets of Staffordshires reached the eastern bank and began to consolidate there, the first Germans began to surrender. In the centre, 1/5th Bn. 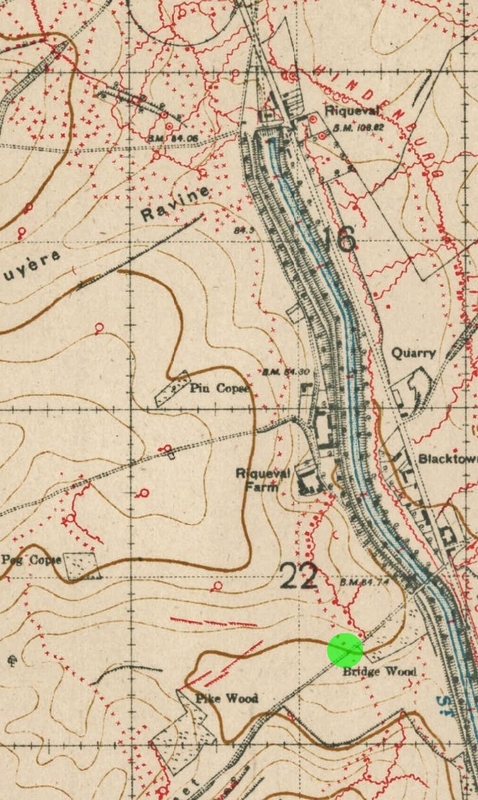 South Staffords, attacking on a 500 yard front, found that, despite deeper water than at the bridge, the fog and smoke of battle allowed them to cross the canal using their improvised crossing devices far quicker, and with less difficulty, than expected, despatching the German machine gunners on the east bank, while to the south, 1/6th Bn. 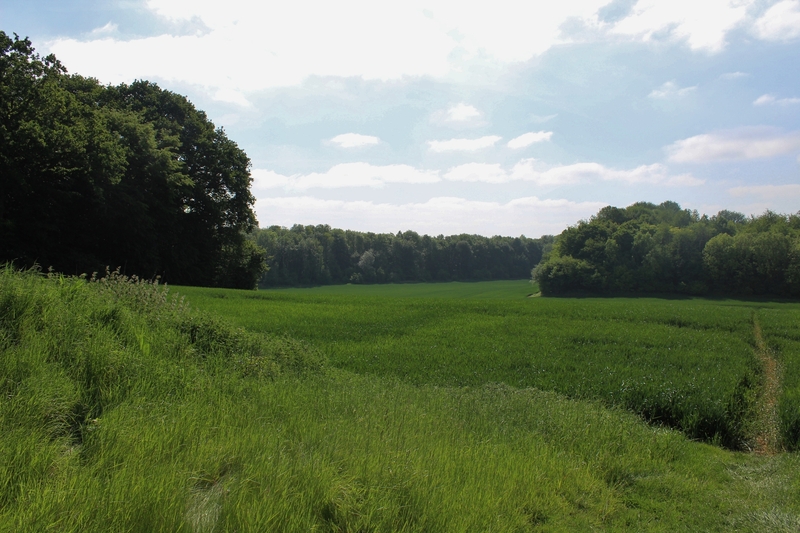 South Staffords overran the German outposts on a 400 yard front, and on reaching the canal found only pockets of water, which they too crossed far easier than expected, many Germans on the east bank surrendering. 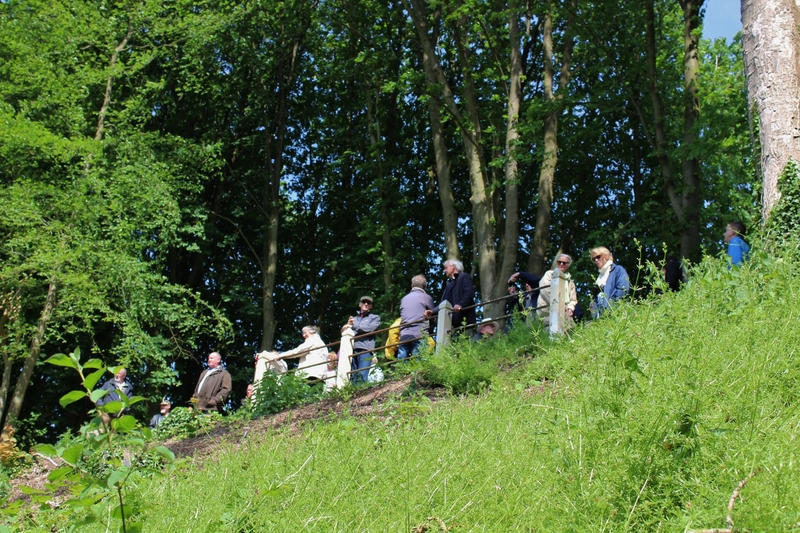 Once the east bank had been consolidated, and following another creeping barrage, they advanced towards the Hindenburg Line trenches just beyond the canal bank, the whole 46th (North Midland) Division descending on the Germans who, those that were unable to retreat to the east, began surrendering en masse. 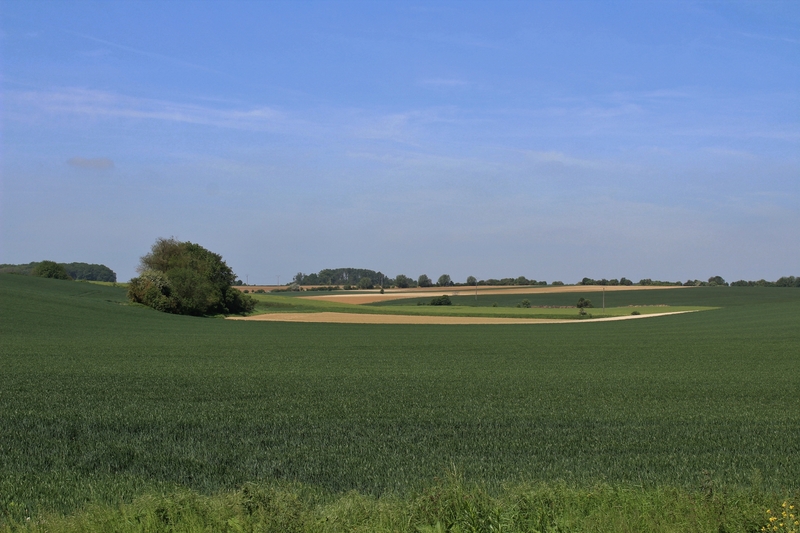 By 8.30 a.m., and pretty much according to the timetable laid out in their orders, the men of the 46th (North Midland) Division had swept across the German outposts in the fields to the west of the canal, crossed and secured the canal itself, and overwhelmed the Hindenburg Line trenches that were, according to the Germans, impregnable, taking 2,000 prisoners along the way. By mid-afternoon they had made contact with the Australians who had leapfrogged the Americans north of the tunnel entrance, and met all their objectives, including the ridge beyond the villages of Lehaucourt and Magny-la-Fosse, on schedule, at a cost of some 800 casualties. Across the whole front of the attack, however, the day ended as one of mixed fortunes; progress in the north towards the underground canal had been in general disappointing, with none of the final objectives achieved, and away to the south, frankly nothing very much happened, the French contribution being, in effect, a demonstrational artillery barrage and a limited advance. In the end the day’s one major success came where it was least expected. 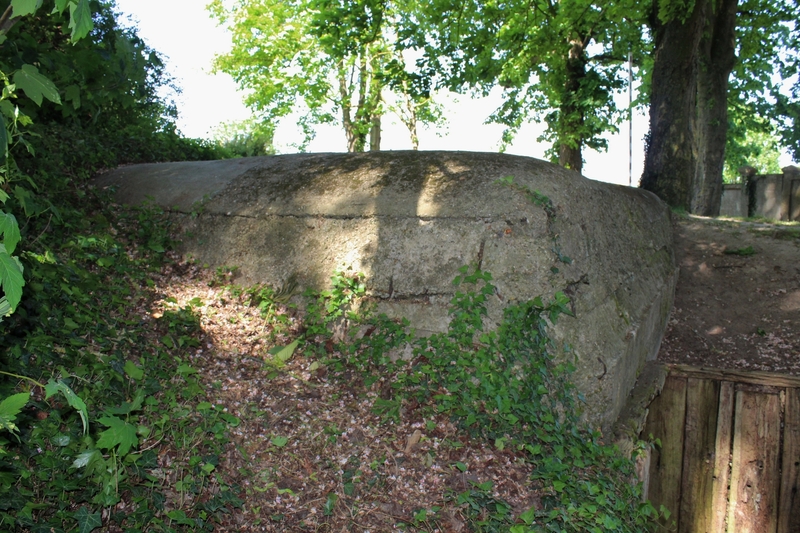 46th (North Midland) Division had succeeded in crossing the canal, capturing the bridge at Riqueval and breaching the Hindenburg Line, achieving all its objectives by mid-afternoon, and capturing 4,200 German prisoners and some 70 guns along the way. The following day the two American divisions were relieved; 27th Division suffered about 3,500 casualties during the course of the battle, and 30th Division lost 1,881 men, which is very exact. Just saying. 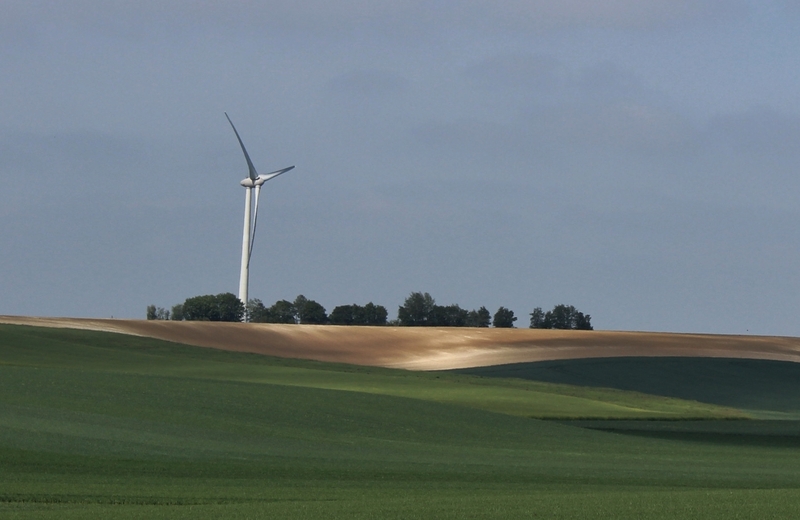 …vast open fields with little to give the attacking troops cover. 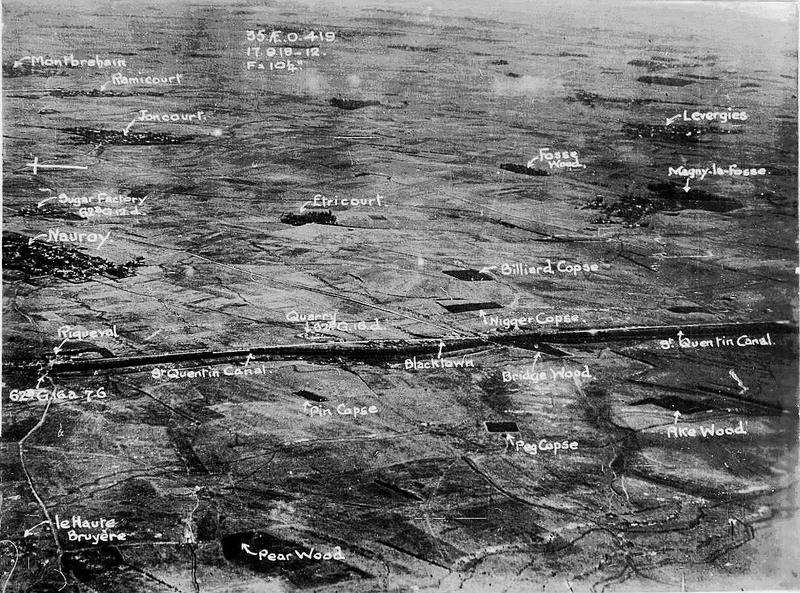 If you consider the preceding years of stalemate, it seems quite staggering that the vaunted Hindenburg Line, with its lines of trenches, fortified bunkers and vast swathes of barbed wire, could be breached and then broken in just one day, the struggles of the Americans and Australians a couple of miles north proving that, despite the fog covering the battlefield that proved such a boon for the attacking Allies, resolute defence and an accurate counter barrage could still have the upper hand. Which does, perhaps, bring us back to the question of morale. As I said earlier, a book unto itself. Over the next three days, as communications were re-established with the forward troops and artillery brought forward, further limited attacks were made, again with differing results. 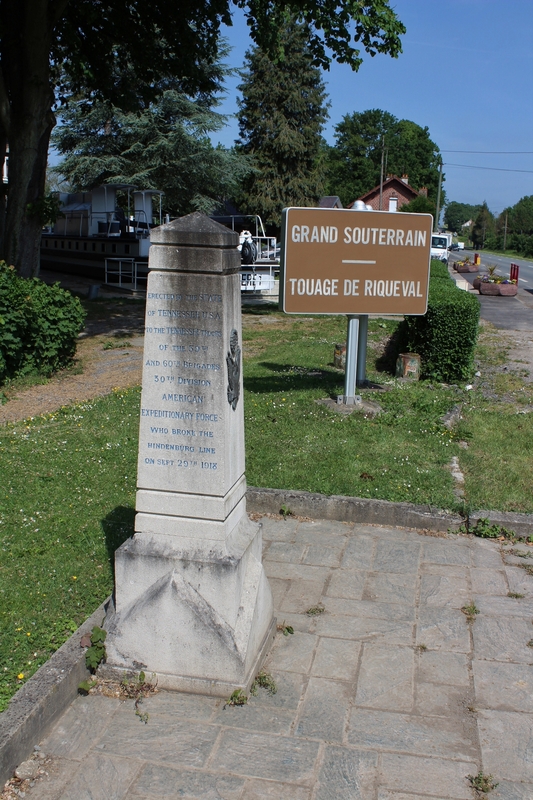 To the south the British IX Corps and the Australian Corps pushed on, assisted by a German withdrawal on the night of 30th September which included the evacuation of St. Quentin itself, capturing Joncourt, almost three miles east of the Bellicourt tunnel entrance, the Australians then penetrating and holding a section of the Beaurevoir Line beyond. 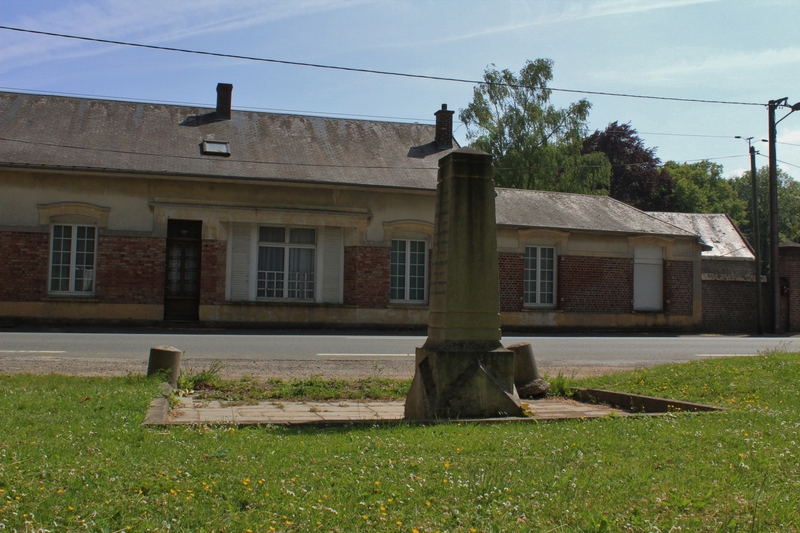 To the north of Bellicourt, however, the 3rd Australian Division was encountering stiff resistance in the Hindenburg Line itself west of the village of Bony (still to the west of the underground canal, which also shows the lack of progress in the northern section on 29th September) which resulted in a period of fierce hand-to-hand fighting before the Australians broke through, capturing Bony and, finally, the section of the Hindenburg Line still in German hands that the American 27th Division had attacked on 29th, pushing east towards the Le Catelet-Nauroy Line. 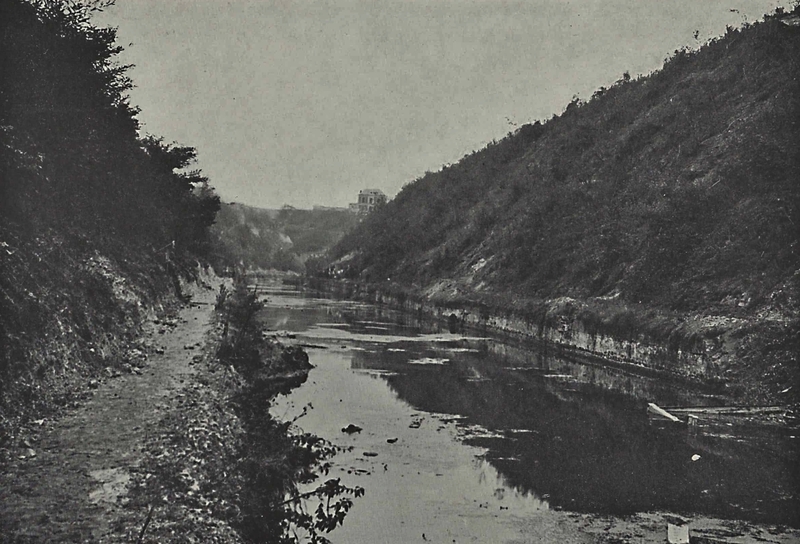 North of the where the canal reappears, III Corps advanced forward to the canal bank but did not attempt a crossing. As our field walkers do their thing, we near the end of this post. Inset: American soldier and German medic pose for the camera. 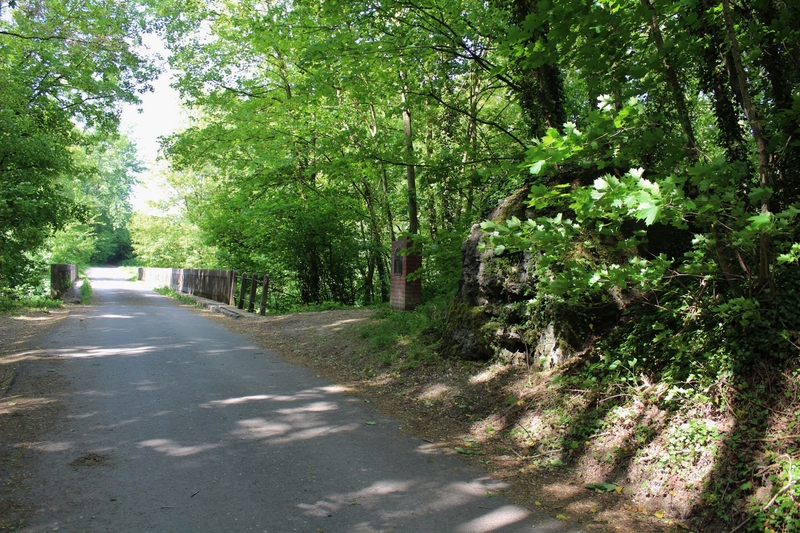 German trench leading to the Bellicourt tunnel. 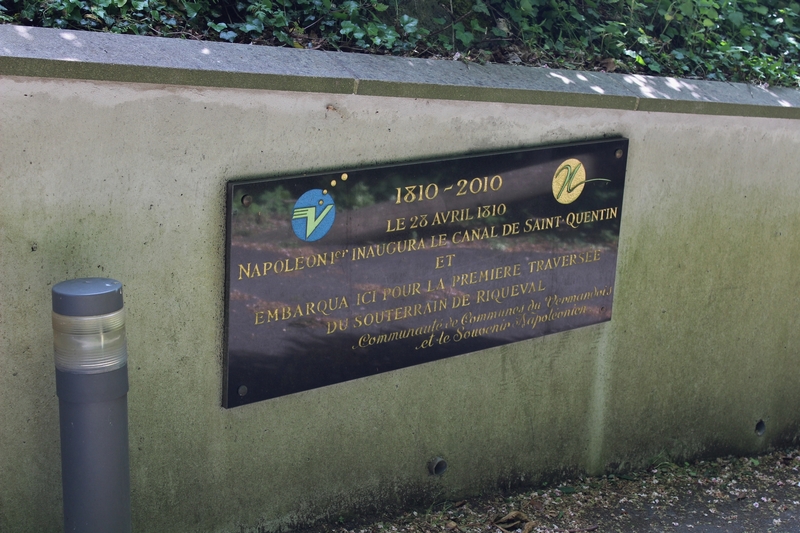 The Battle of the St Quentin Canal officially ended on 2nd October 1918, by which time a breach of over ten miles had been made in the vaunted Hindenburg Line, continuing British & Australian attacks reaching and capturing the third line of the Hindenburg defenses, the Beaurevoir Line, and eventually, by 10th October, reaching the fortified villages and heights beyond. 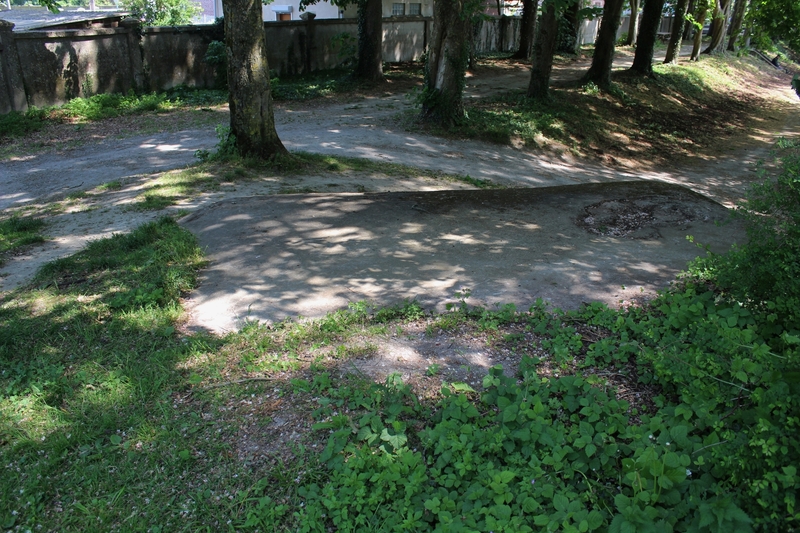 In this sector, at least, the Hindenburg Line was now behind them. On 6th October the whole Australian Corps was withdrawn from the front line for a rest; it would not return before the Armistice. 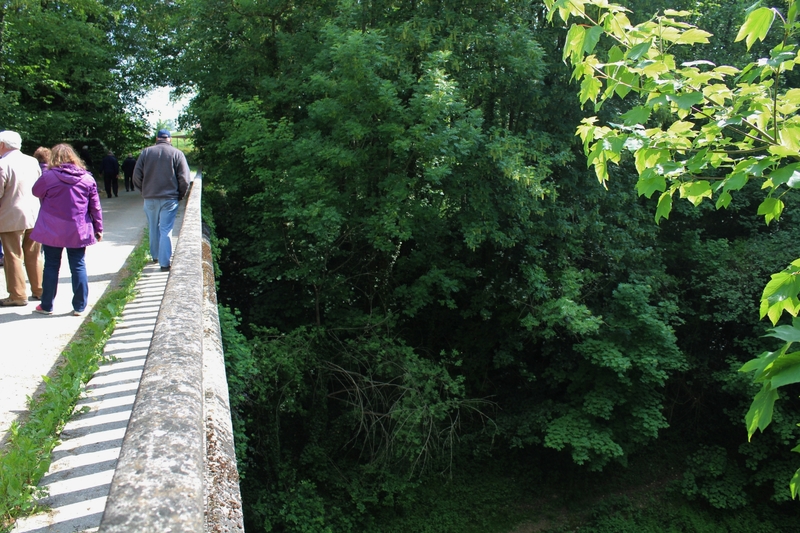 More views of the Riqueval bridge after its capture. 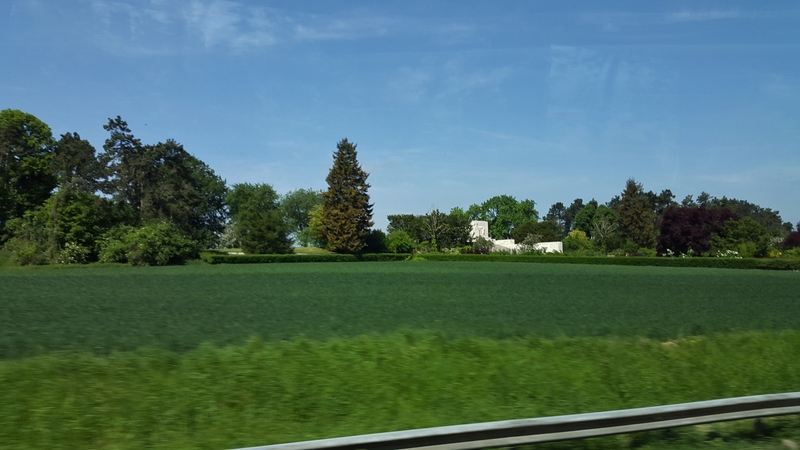 Once back aboard the coach, our next stop an appointment with a cross-channel ferry, you might think yours truly might consider it time to relax. Not a bit of it. 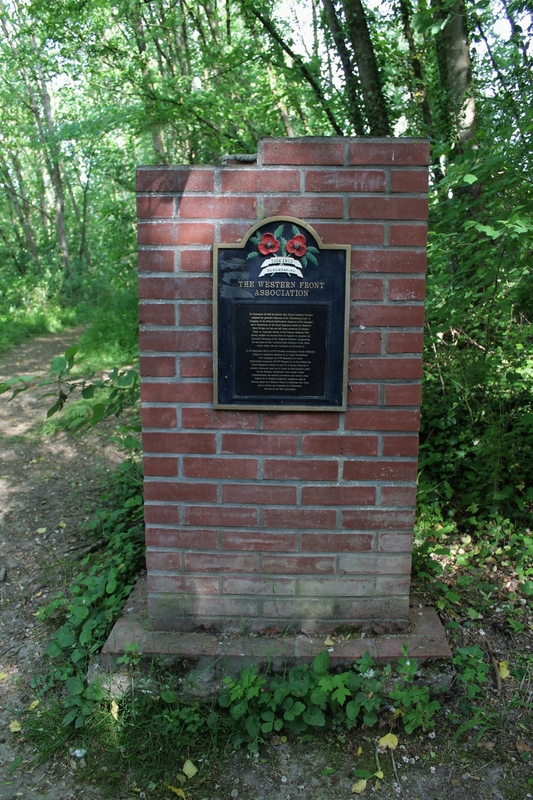 I had no idea that this memorial was here, nor that we were heading straight past it, nor what it commemorates, until it appeared through the trees to our left. But it’s a good job, bearing in mind the content of this post, that I started snapping away furiously as we passed by. 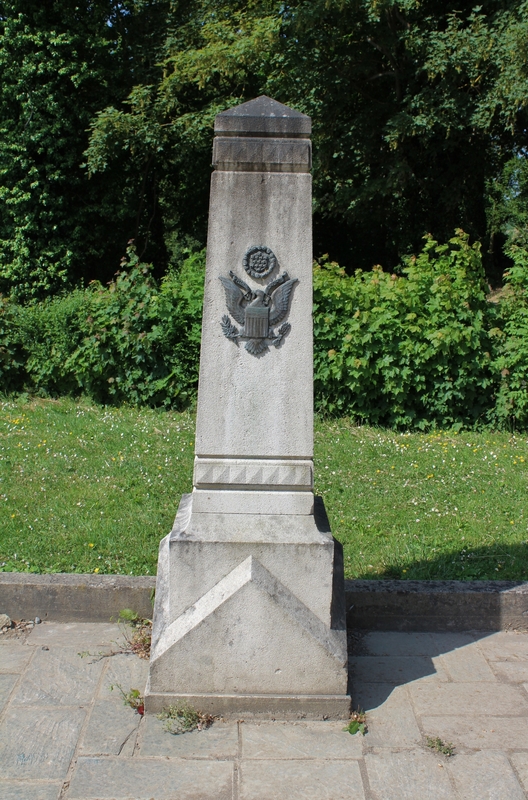 A mile and a half north of the tunnel entrance, directly above the underground canal, this is the Bellicourt American Monument, dedicated in 1937, that commemorates the battle achievements and the sacrifices of some 90,000 U.S. troops who served in battle with the British Armies in France during 1917 & 1918, including, of course, the men of 27th & 30th Divisions who fought on this very battlefield. Luckily for us, one of our regulars was here a few years back, so with huge thanks to Daisy in Bandung, I can show you these close-ups of the memorial – the centre photo shows the reverse side. 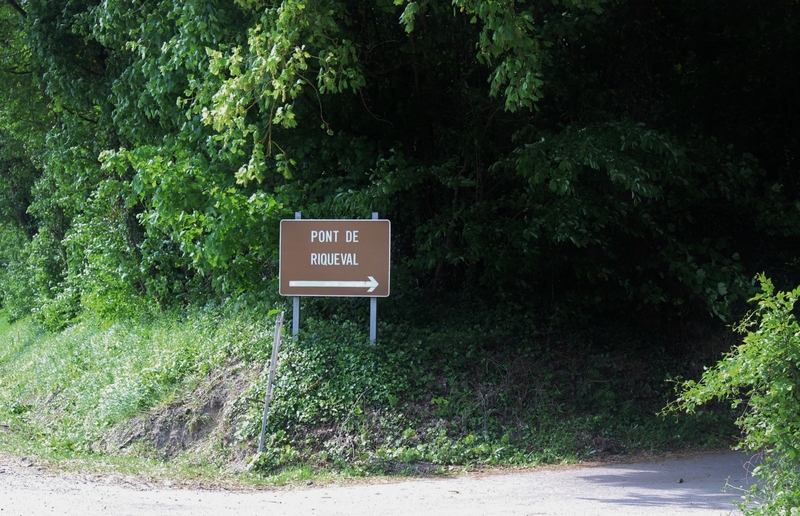 …right in the centre of the American attack of 29th September. American casualties from the battle were interred in the Somme American Cemetery near Bony, a mile away across the fields to the north west, and still very much on the battlefield where they fought on 29th September, and where the names of the missing can also be found. Although I haven’t marked it, you’ll find it easily enough on the map coming up after the next picture; I might even show you round it soon. 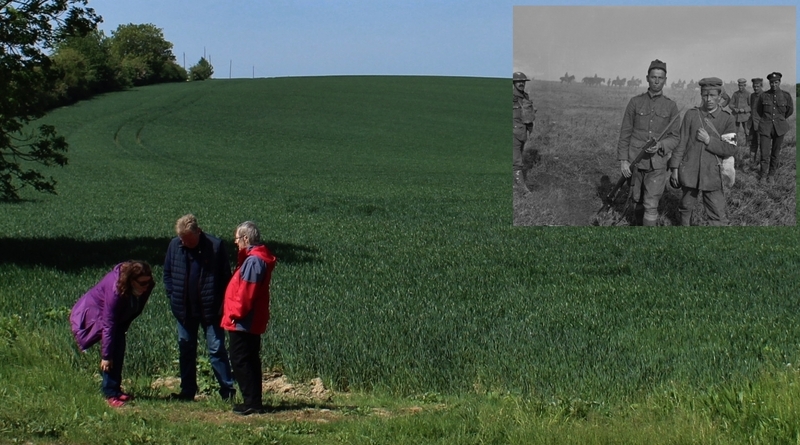 Two more photos courtesy of Daisy, the top one looking pretty much due west, as is the main photograph, and giving a good German-eye view of the battlefield (the copse on the horizon to the left of the top photo is the lozenge shaped wood near the top of the map below). Finally, a Google map of the area we have covered during this post. 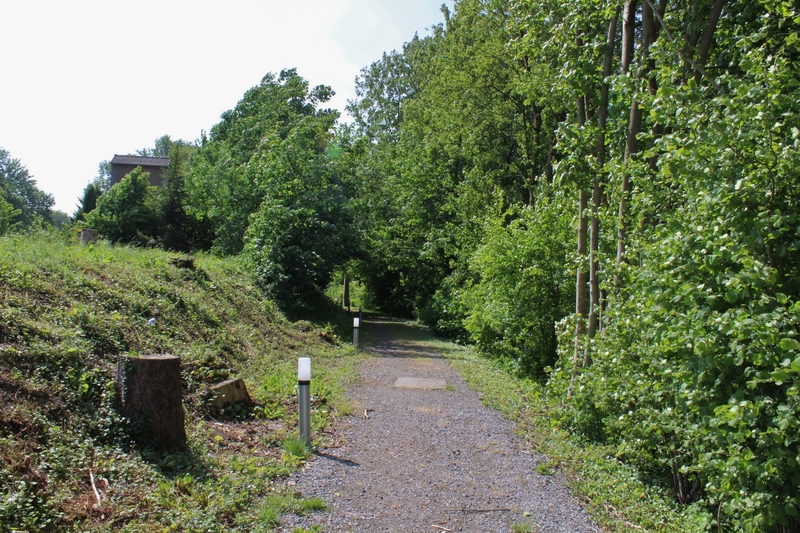 Our canal walk and the bunkers and memorials are all marked, and the scars left by the Hindenburg Line outposts in the fields to the west of the canal are still clear for all to see to this day. This entry was posted in 1918 - The Advance East, The Somme. Bookmark the permalink. Hello Magicfingers. Wonderful story well told & great photos original & current. Thank you so much for this post especially with perfect timing for me as I will be in the area next week as you know for the Montbrehain centenary commemoration. I have been in the Riqueval & canal location in 2015 but you have shown me some other things to check out on this visit. Much appreciated. 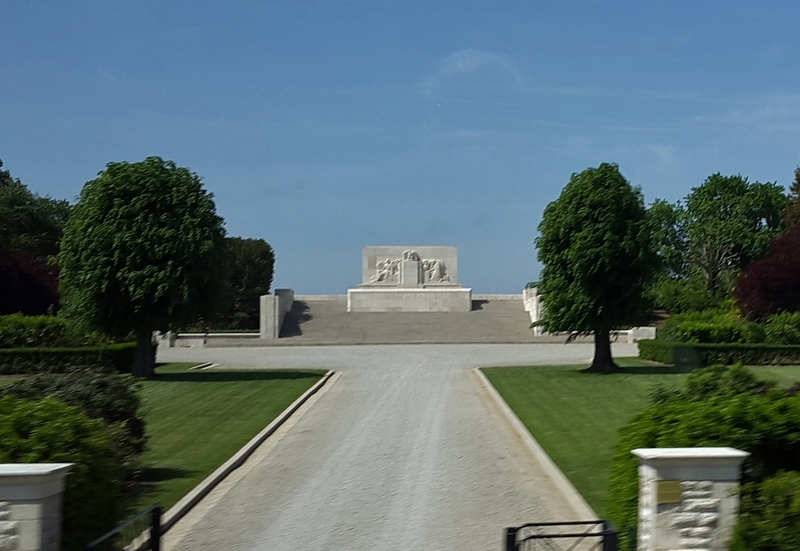 I spent some hours at the American Memorial & can send you the photos if you wish. 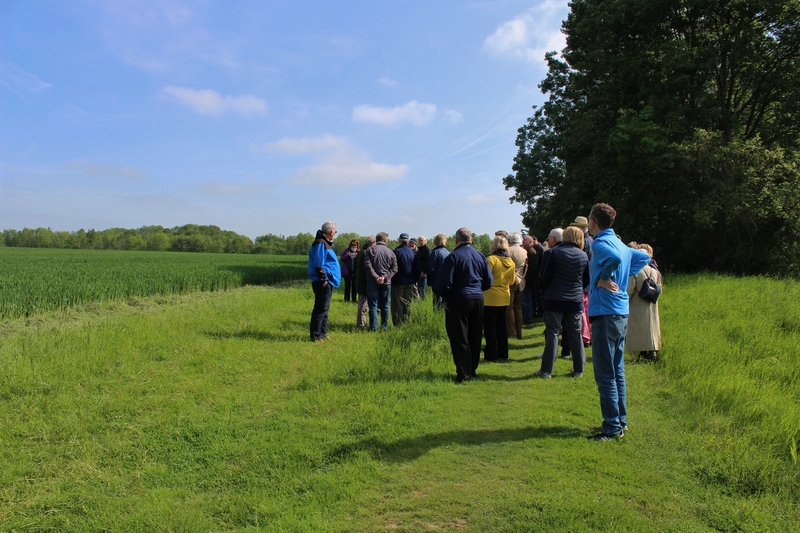 Overlooking the battlefields, it has been made extremely well & worth some time there. 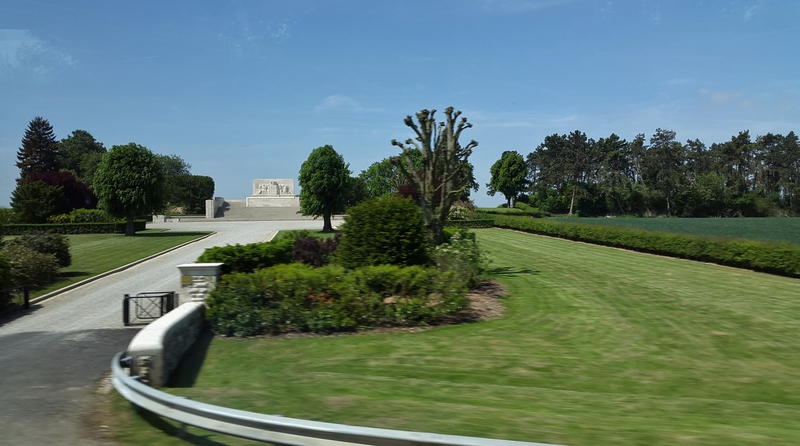 I visited the American cemetery at Bony late the same day. I was the first visitor for a week. A very beautiful place & meticulously kept grounds as you would expect from the Americans. The story of the construction is interesting particularly the trees. As it was almost 5pm the Director informed his French assistant I would be lowering the flag & I would help with the traditional folding of the flag. Terrific experience & sent shivers down my spine as I gingerly lowered the Star Spangled Banner.. 12 months later on my next trip my Indonesian wife & my 8 year old son were allowed to do the same thing. Wonderful… I was blown away by this gesture both times. Once again, love your work Magicfingers. Packing my suitcase in Bandung now! Hello Daisy. You are too kind. Took some work, this post, so I appreciate your comments greatly. 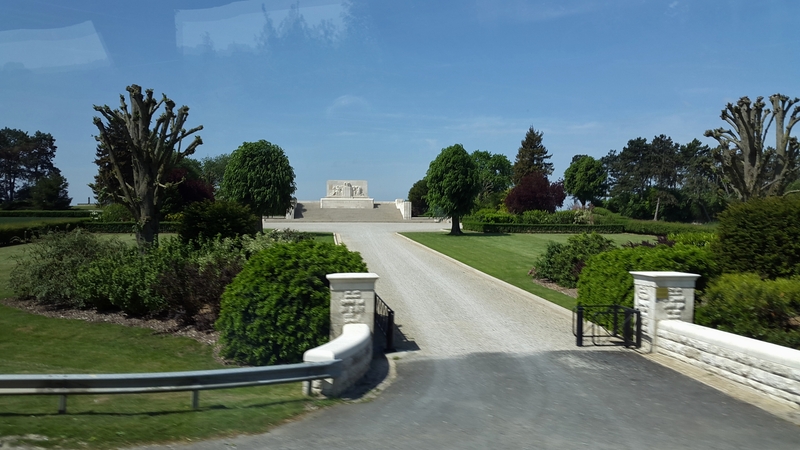 It is possible that the American Cemetery (I can quite imagine folding the flag was very special) at Bony might feature somewhere around here quite soon……..and your offer of pics of the memorial – yes please!!! Meantime, have a great trip. Going to the Strand Military Cemetery tomorrow to pay respects to my great uncle John Sherman whose grave is there, he died in the Great War on 30/09/1918. 100 years! Proud to visit him. I have no doubt you are, Granville. And exactly 100 years on. Have an excellent day. This is a truly remarkable piece of writing; so little attention is given to the Last 100 Days but Magicfingers has brought to life one of the key engagements in breaching the Hindenburg Line and leading to the collapse of morale which Monash had hoped for. I am going to a conference on 20th Oct on the role of the various Staffordshire Regiments in the Great War and with your kind permission I will mention your blog . . . no, not mention it, I shall get on my hind legs and broadcast it widely! Nigel, thank you very much. I really appreciate your comments and absolutely agree that little attention is given to some staggering achievements made by the British Army in the last months of the war. I tried very hard to, as you kindly say, bring to life something of what happened here, and of how crucial it was, and if I have succeeded then I am more than satisfied. As I have never been known to be a shrinking violet, and am always on the lookout for ways to reach an (even) wider audience, please feel free to broadcast as widely as you choose! And thanks in advance for so doing. Have an excellent conference. And if you meet anyone there who knows the first name or names of Captain A. H. Charlton, I’d love to be able to add it/them to this post. Hope the link works as this may be your man. Think he may be buried Pine Lake Cemetery, Alberta, Canada. We’ve spent some very enjoyable visits to Alberta. 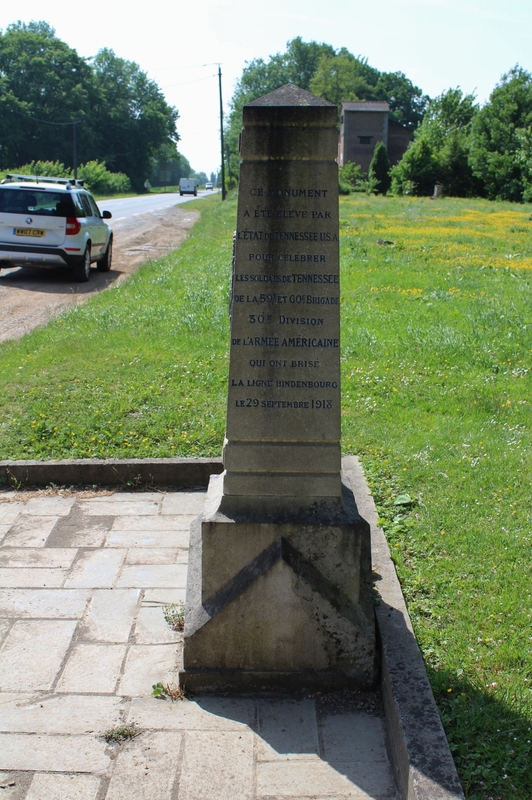 With reference to the post we visited the Bellicourt American Monument last year, restoration work in progress. Yep, that’s him. Thanks Barbara. I shall add a little about him to the text. Btw, as I am on holiday I shall be checking all emails when I get home in ten days or so. Think it may link here yesterday visited Stapenhill Burton on Trent for the unveiling of the VC Memorial Stone – stretcher bearer William Coltman DCM and Bar, MM and Bar, VC 1/6th North Staffordshire Regiment. How interesting. I didn’t know anything about William Coltman until now – his V.C. was awarded for his actions a few days later, but his Bar to his D.C.M. 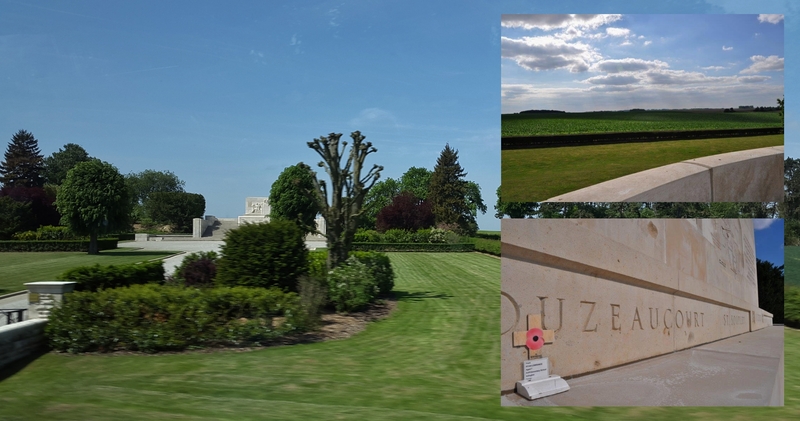 was earned at Bellenglise: ‘On the 28th September, 1918, near the St. Quentin Canal, near Bellenglise, he dressed and carried many wounded men under heavy artillery fire. During the advance on the following day he still remained at his work without rest or sleep, attending the wounded, taking no heed of either shell or machine-gun fire, and never resting until he was positive that our sector was clear of wounded. 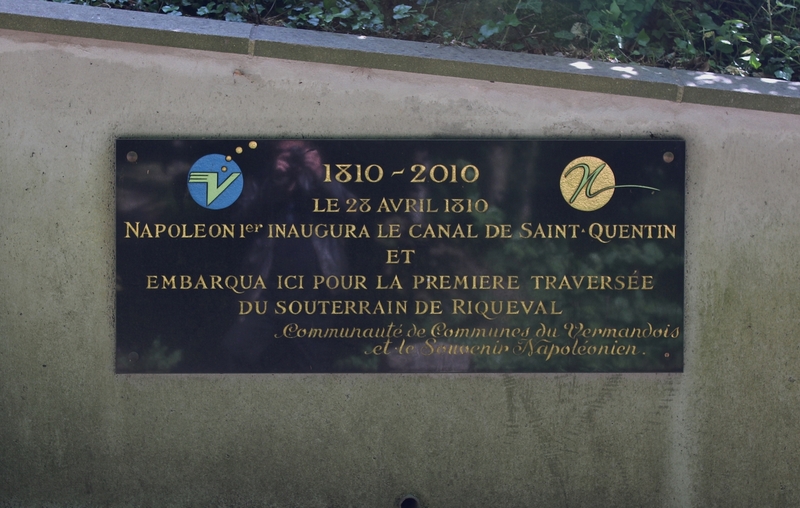 He set the highest example of fearlessness and devotion to duty to those with him.’ The advance the following day was of course the crossing of the canal. Thank you Barbara. This is a really excellent piece of work. Thank you. 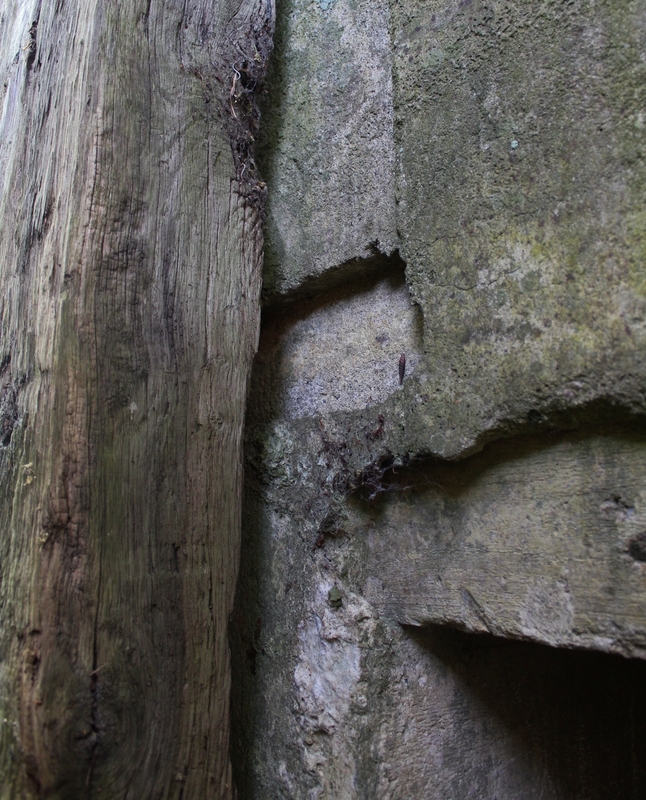 I was at the Riqueval Bridge with a battlefield tour group from the Staffordshire Regiment on the 29th September, exactly 100 years to the day when it was captured by 137 Staffordshire Brigade, and this post has now added additional details to my knowledge of the battlefield. 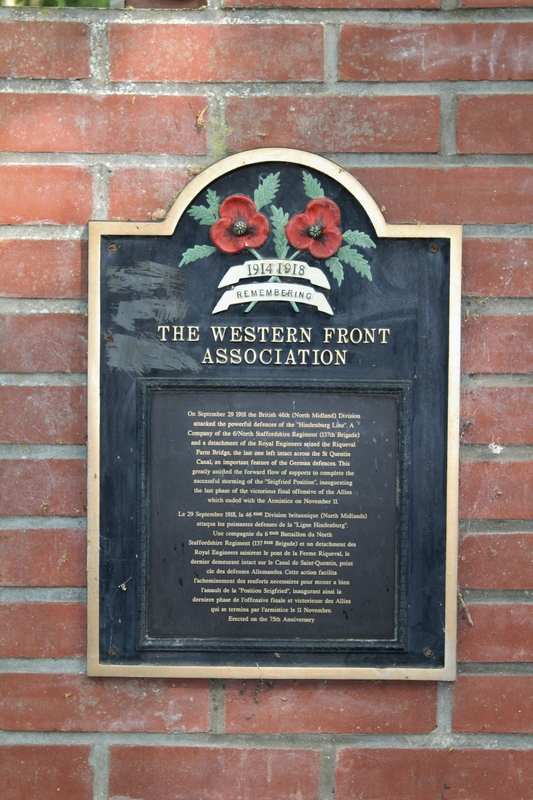 Later on the same day, the Western Front Association rededicated the plaque on the memorial on the eastern side of the bridge in a small, but moving, ceremony and there is now a new plaque on the repaired brick memorial. Hello Mike, and thank you for thanking me! 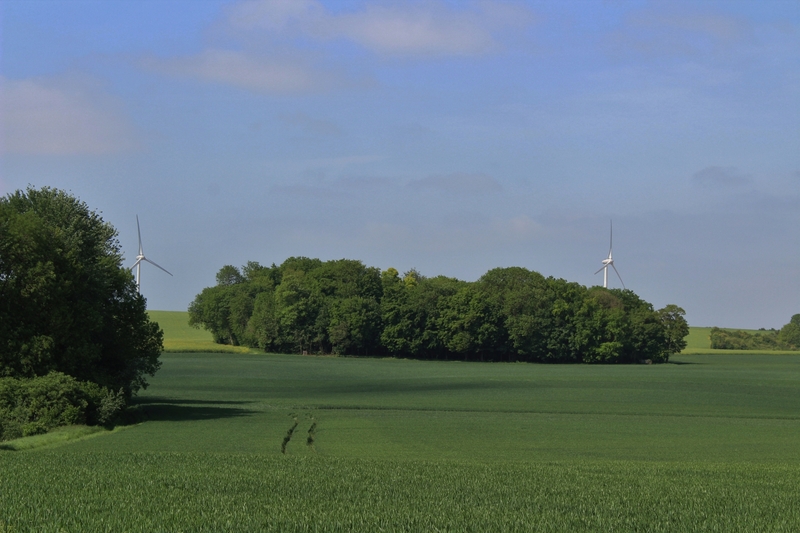 Glad you enjoyed this post and nice to hear it added some details to your understanding – especially as you were on an official Staffordshires tour. I think I am feeling a tiny bit smug. Nice to hear about the rededication too. If you look at some of the comments before yours, you will notice that one of our regulars here is off to a conference on 20th October on the role of the various Staffordshire Regiments in the Great War. Great report M brilliant for me as I was there earlier in the year as you know but this filled in the story around the bridge and the canal which the tour didn’t have enough time to cover. 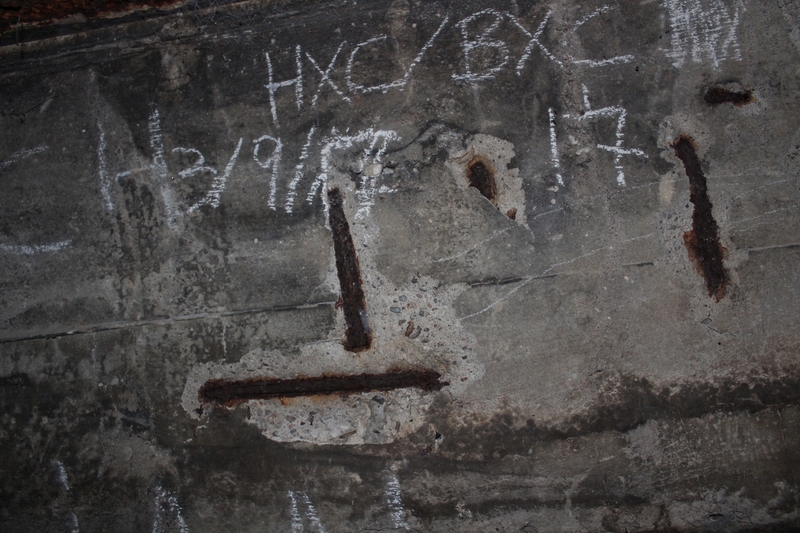 I will always remember now the 29th September the day we broke the Hindenburg line as it’s the day I was born not 1918 of course. It showed the inexperience of the American troops though and how a big difference was made when you put experienced troops into the mix. 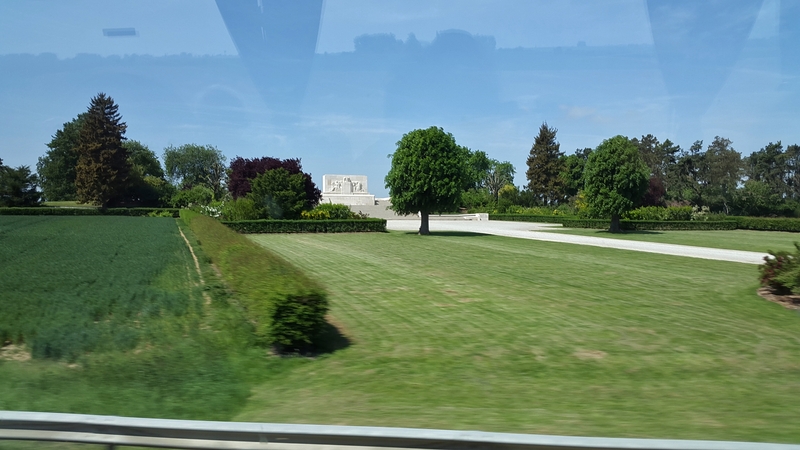 Well thank you very much M. You will understand completely when I say that our coach tour was similar – because I have since spent a lot of man hours writing this post my brain now tells me that I knew all this stuff when I visited – but I know that’s not true. Lots of it was researched post-tour, so next time I visit I will appreciate the place even more.